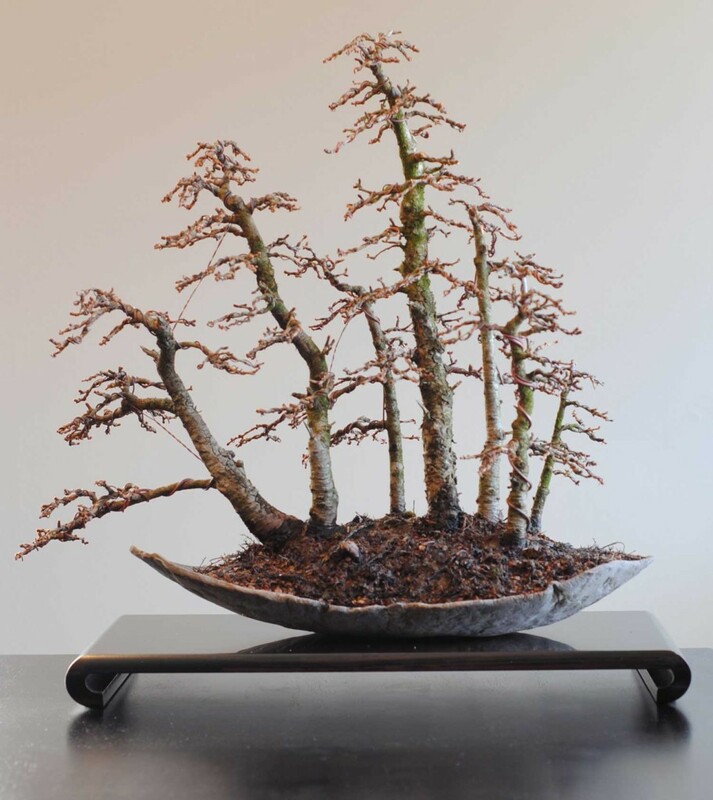 This small Ulmus pumila was displayed at this year’s Toronto Bonsai Society Fall Show and Sale. 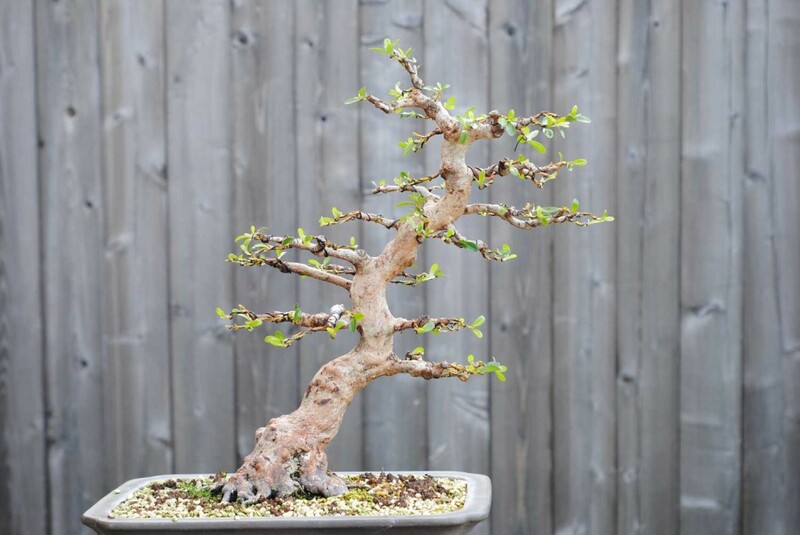 Ulmus pumila shohin. Yellow pot by Sugiura Keisen, accent pot by John Pitt. The tree was developed from a naturally layered low branch from a much larger elm that was collected from a hedge, along with many others. The shohin elm was a low back branch on this larger tree (circled in red). After separating the rooted branch in April 2011. Finding worthy trees to collect in urban environments is just as difficult (if not more so) than finding worthy trees in the wild. 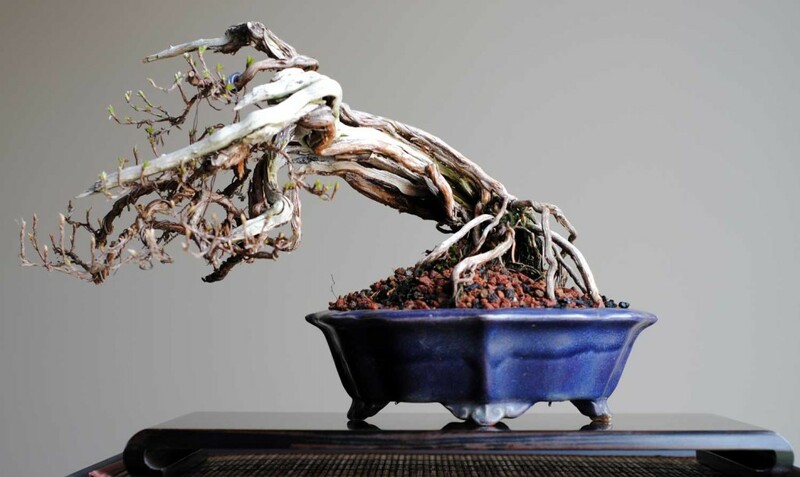 The criteria is the same though – you are looking for trees which have been growing for a long time in an environment where they are repeatedly punished such that they develop the characteristics we are looking for in bonsai. It is therefore often helpful to first look for the environment. Once you’ve found that, finding the tree is easy (or easier). 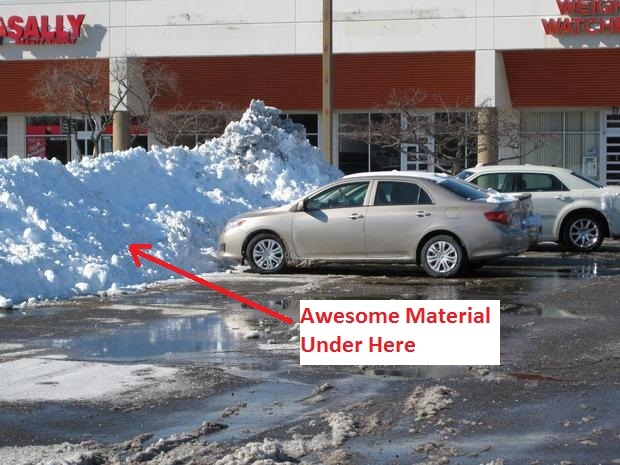 I’ve noticed one particularly tough urban environment that is common in snowy climates: the perimeters of parking lots where massive piles of snow and ice accumulate after the snow plows come through. 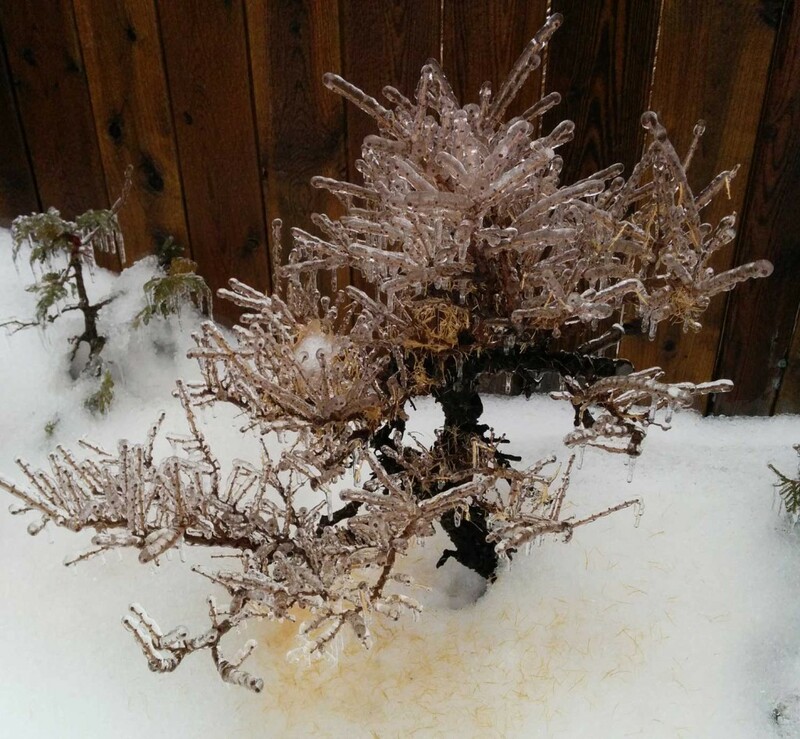 Any plants (particularly conifers) unlucky enough to be in a place where it is convenient to pile snow have a good chance of developing the characteristics we look for in yamadori. 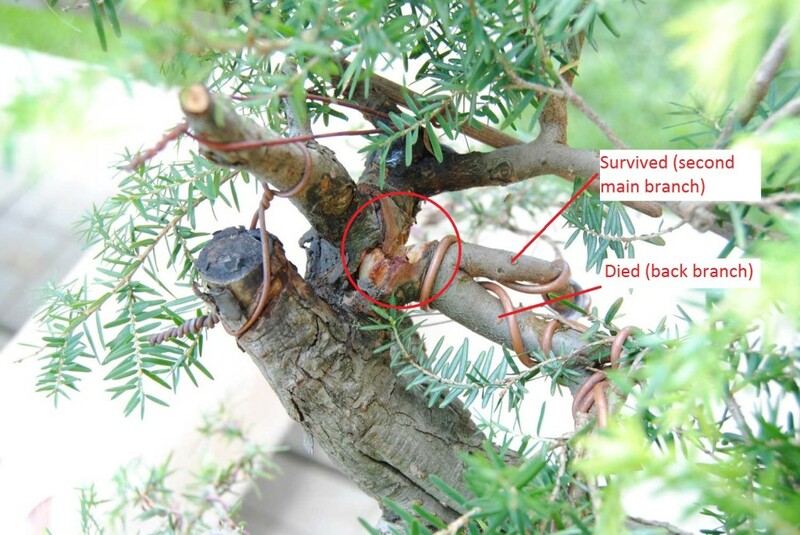 After a few decades of this, most woody plants will either be dead or extremely damaged. Common species planted on these borders are tough, low-growing conifers like yews, junipers, and mugo pines. If you see something you like, act fast to get permission and dig. Often these parking lots are managed by contract landscapers who will rip out these ugly plants during the spring cleanup. I learned that the hard way this spring when a patch of mangled junipers I wanted to get at was replaced by some lilies as I procrastinated over approaching the landlord. 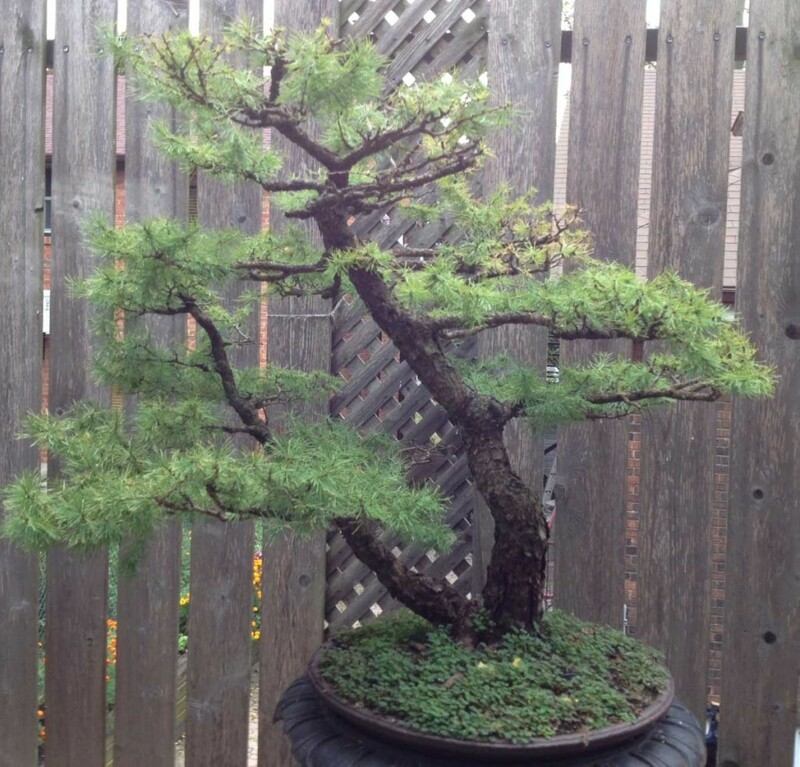 I was inspired to write this post because recently I dug a mugo pine from a very similar situation. The trees on the outside of the planting get the most punishment. 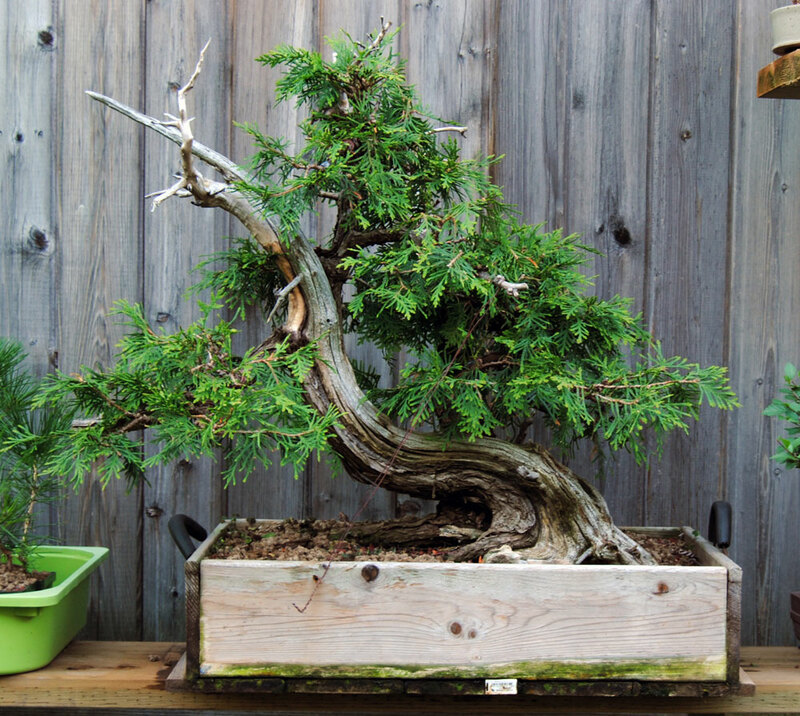 This simplifies finding and digging potential bonsai material. Much easier than digging a tree out of a pile of fist-sized rocks! Large single trunk mugos like this are very hard to find on this side of the Atlantic ocean. 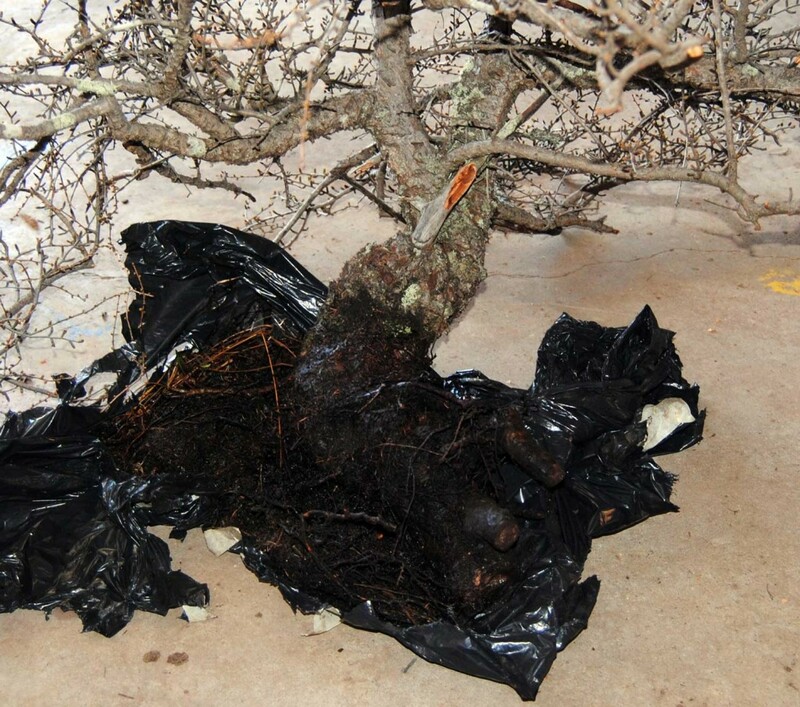 As this is probably not the ideal time of the year to be collecting a mugo, the tree was treated as a balled-and-burlapped nursery tree and planted in a raised bed with minimal root disturbance. 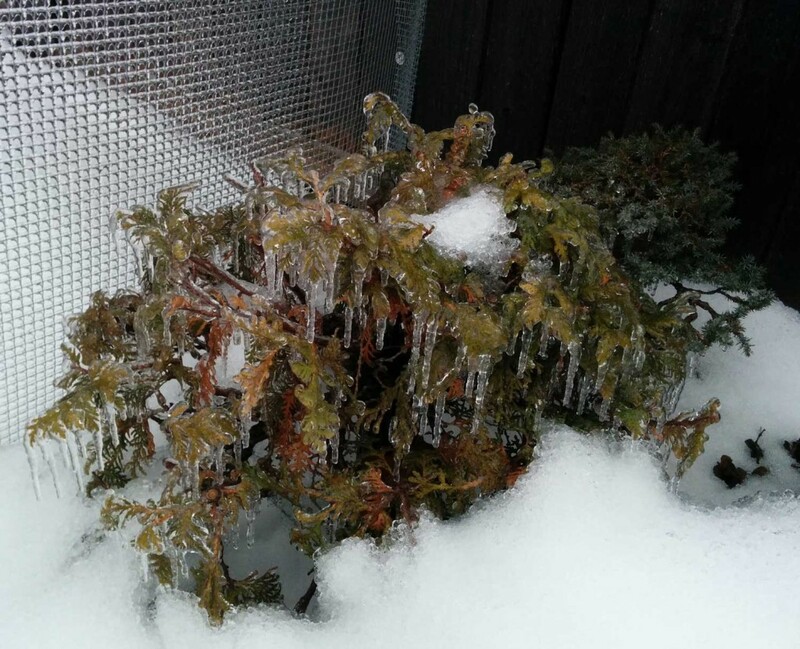 If it doesn’t die, it will be planted in a container in Spring 2016. Trunk detail. Nice job, snow plow operator! In my experience mugos backbud well so I’m not worried about the leggy growth. This is certainly a 10+ year project though. This is peak season for eastern white cedar foliage shedding. 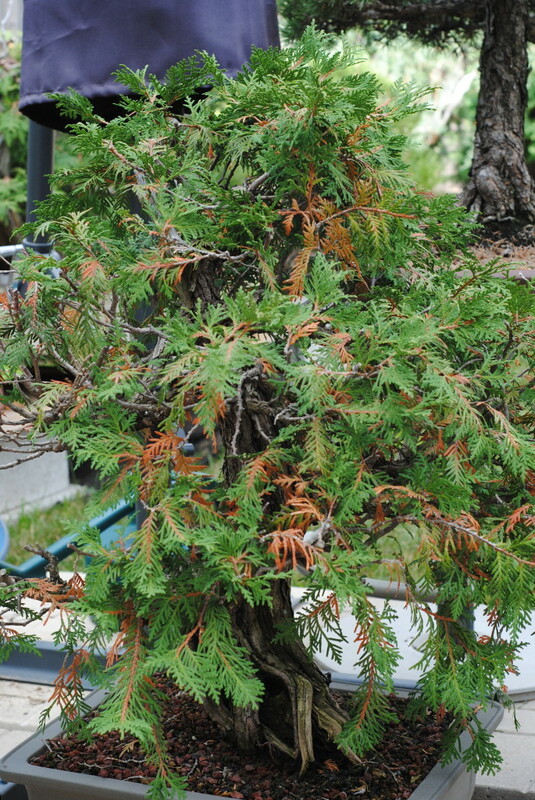 While not at all a health concern, it is somewhat unsightly and can leave your tree looking quite sparse. 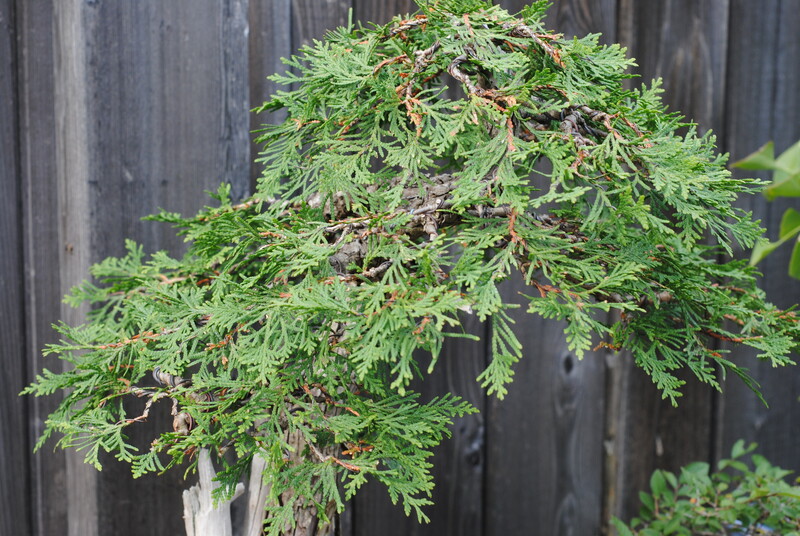 To reduce autumn foliage shedding, I’ve been following the advice of Reiner Goebel and making sure I prune my cedars some time around mid-August. This year the results are really showing. Bear in mind that if a tree is early in it’s development or recently collected, it is often better to avoid pruning and just let it shed. 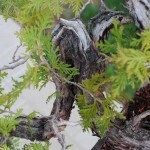 This is the first large Eastern White Cedar I collected. After four years of growing, the foliage mass was finally ready for some real work and this year it has gotten a lot of attention. In July it was thinned and roughly wired, and today it received its second and final thinning for the year. I think this tree is actually two separate trees that have been growing together for a long time. The second trunk on the right is growing towards the back, and I’ve always toyed with the idea of removing it since it seems out of place. David Easterbrook and Marco Invernizzi both advised me not to remove it, and now I am starting to understand why. That secondary trunk provides much of the depth of the tree and without it I would be left with something very two-dimensional. 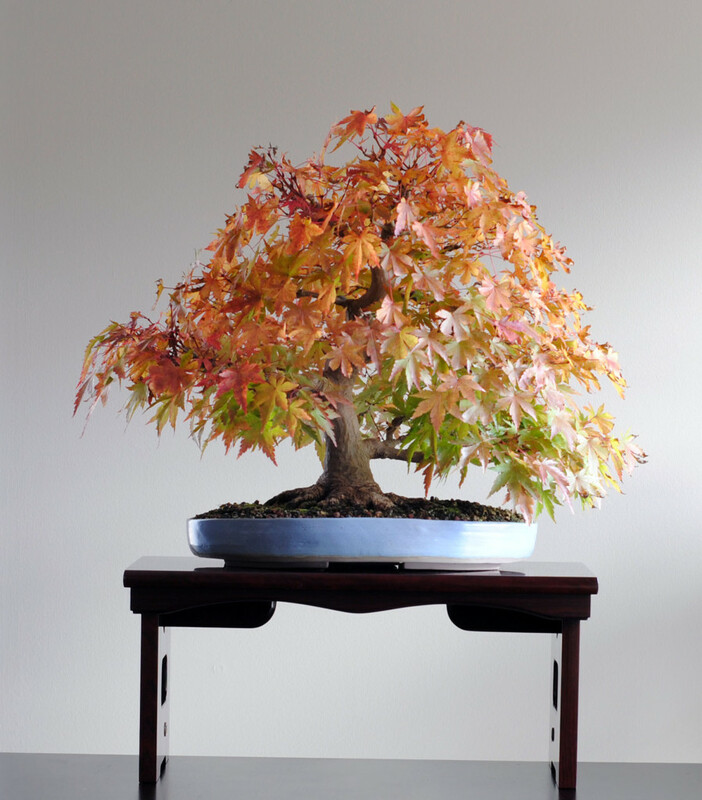 It will be difficult to find a traditional bonsai container that works for this tree. I’ve got some ideas for the future planting, but it will not be easy to pull off. The final planting will determine which of the large jins I end up keeping, if any. If I can sort it out next spring, this tree might be ready to be shown in Fall 2015. As collected Fall 2010. Note the fist-sized rock lodged in the base of the trunk which had to be cut out with a die grinder. Late summer 2011 after removing a major foliage mass from the upper left of the tree. Summer 2012, completely barerooted to remove the toxic muck and repotted into a much smaller grow box. Summer 2013. 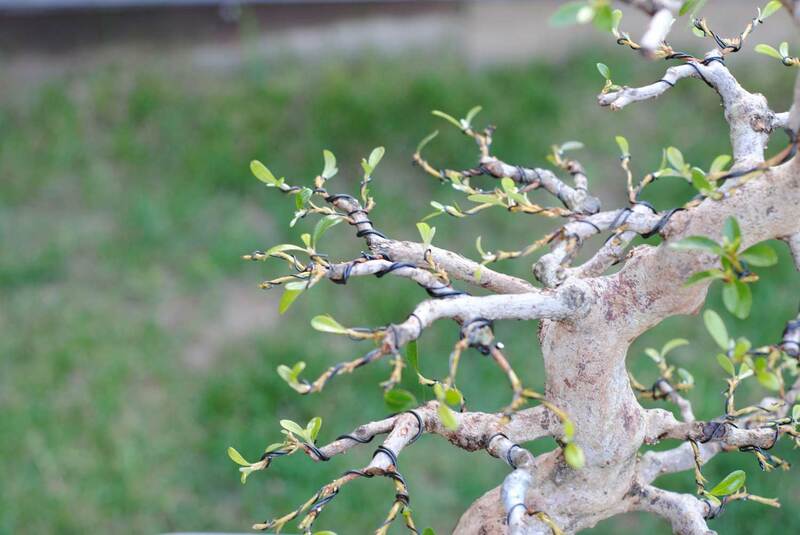 Some major pruning and coarse wiring was done this year to open up the foliage and set the basic structure of the secondary branches. 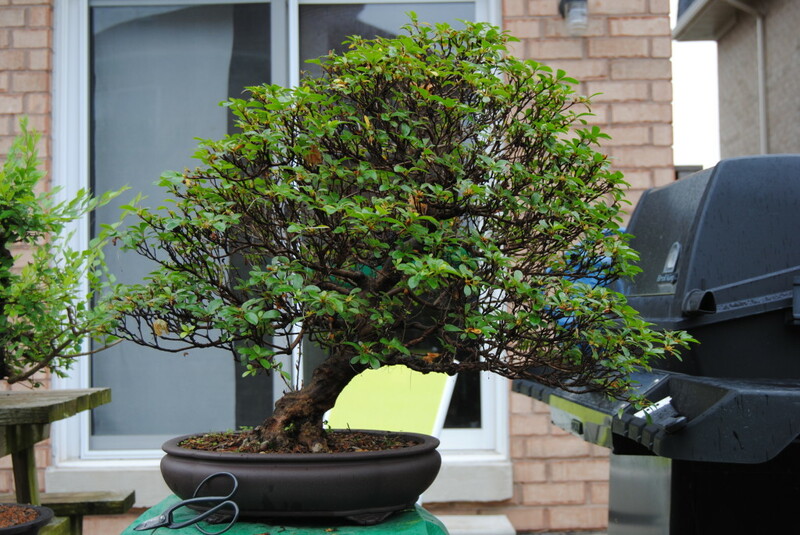 July 2014 after thinning and re-wiring. Today after another round of thinning and minor adjustments. There is still a fair amount of floppy foliage but that is gradually being replaced with tighter growth or removed entirely. This large Thuja was collected in Spring 2013 and this year has been growing well enough that I have started some basic work. 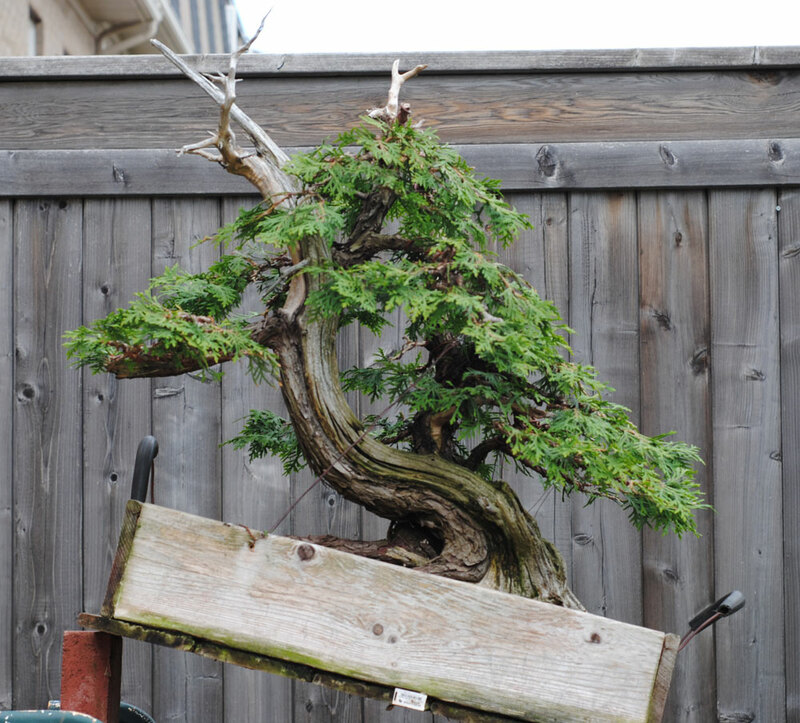 In the first year of collection, I try to do absolutely nothing to a tree – not even move it around the yard. Cleaning work like this invariably involves bumps and vibrations, so I don’t do it until the tree is obviously strong and established in the grow box – typically the second year. 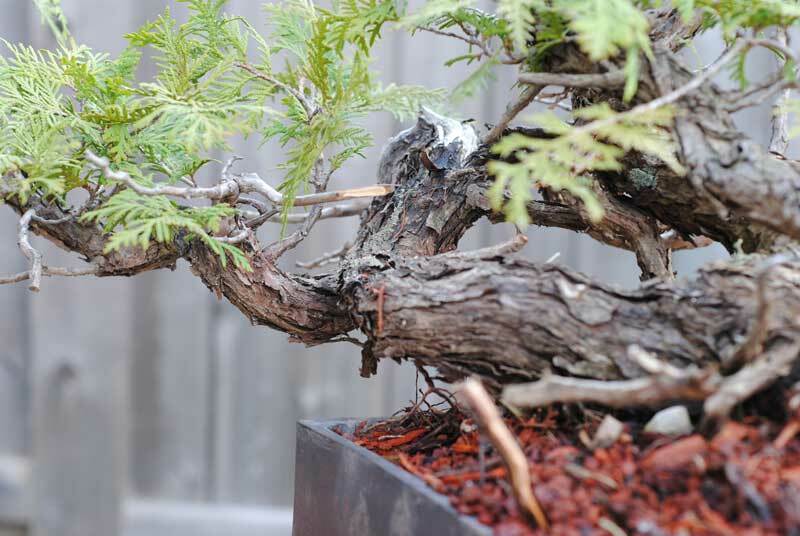 This is not a thorough cleaning – just the removal of bark that come off easily, getting piles of detritus out of cracks and crevices, and cleaning the deadwood with water and a toothbrush to get rid of algae. After this it is easier to study the tree and identify the path of the live veins. As the live veins swell up over the next few years, they will be defined further. The thin dead bark that is really stubbornly adhered to the deadwood will gradually be picked at over the next few years. Removing it right now would require aggressive scraping or rotary brushes that would ruin the natural texture of the ancient wood. I’m estimating this tree won’t be show ready for around ten years, so there is no point in rushing things. 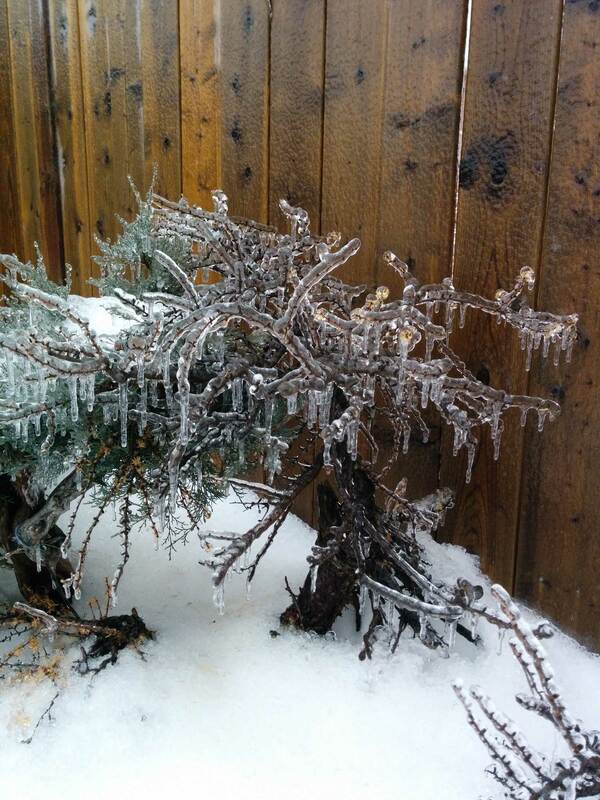 Cycles of wet-dry-freeze-thaw will aid the gentle removal of the bark. 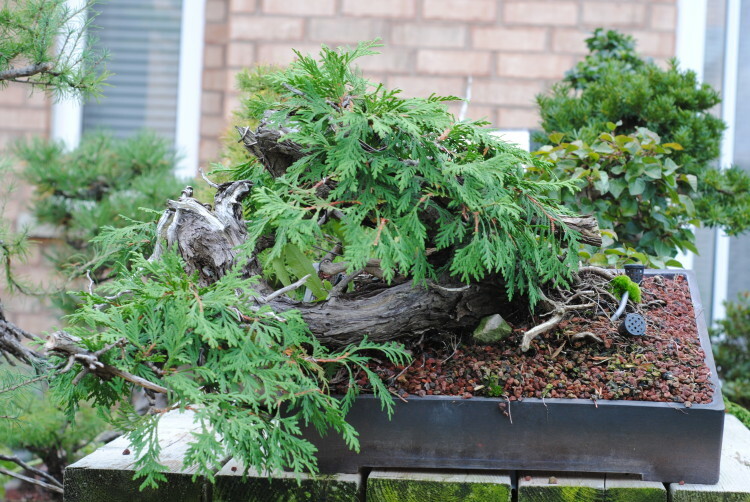 Next spring it will be bare rooted and repotted into a much smaller pot or box. 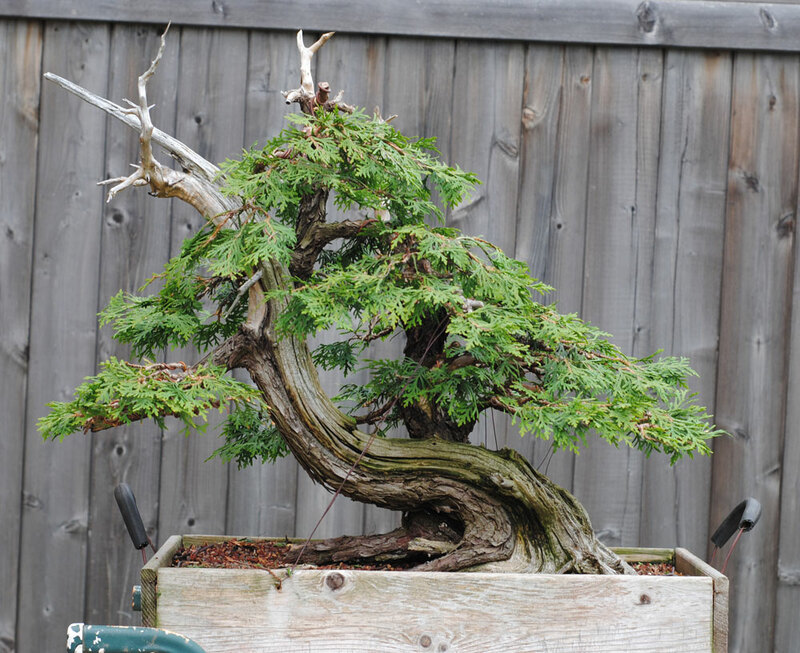 Like most collected Thuja, designing this tree will be a serious challenge. 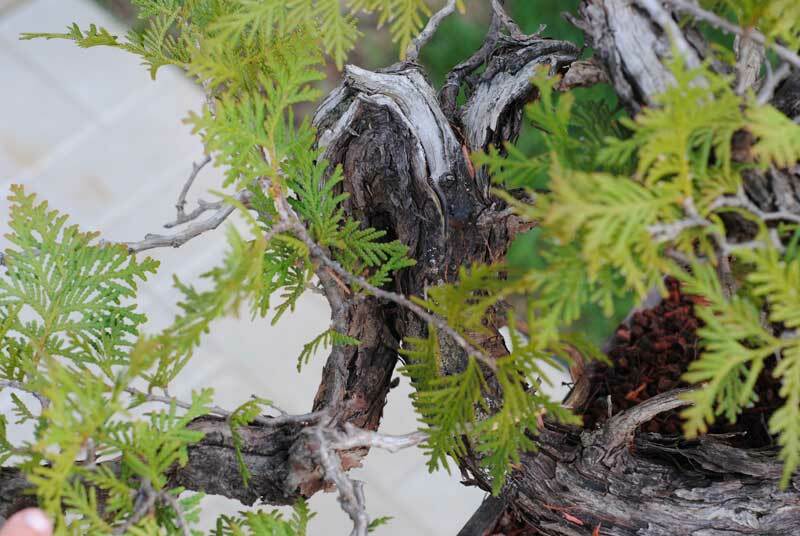 Semi cascade seems like the obvious direction but close examination reveals that there is no easy solution. The thin layers of dead bark are the hardest to remove. Collected Spring 2011, about 30 cm to the tip of the dead spire. The deadwood of this tree was sandblasted last year which helped preserve the lovely little jins. The pot is by Shibakatsu. As I have recently come to own two satsuki azaleas, I realized I’d better figure out how they work. One step I took was buying and reading Satsuki Azaleas for Bonsai and Azalea Enthusiasts by Robert Z. Callaham. It is an interesting book with some good satsuki techniques, but the bulk of it is designed as a reference for identifying cultivars. 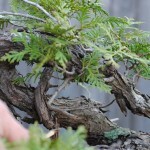 One interesting technique is known as futame-futaba-nokoshi, and it means pruning the tree such that each branch ends in two shoots, each with two leaves. All other growth is removed. 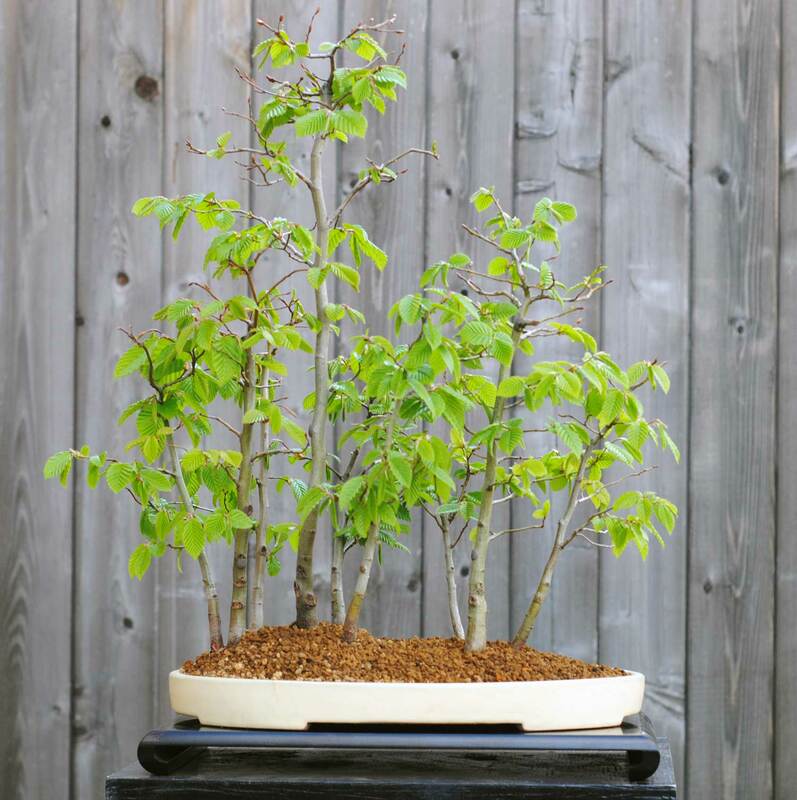 This allows an opportunity to wire the young shoots and promotes budding in the interior of the tree. Essentially it is partial defoliation combined with branch thinning. This ‘Kaho’ azalea which I purchased last summer has been undergoing a major restoration project, and it seemed a good time to apply this technique. 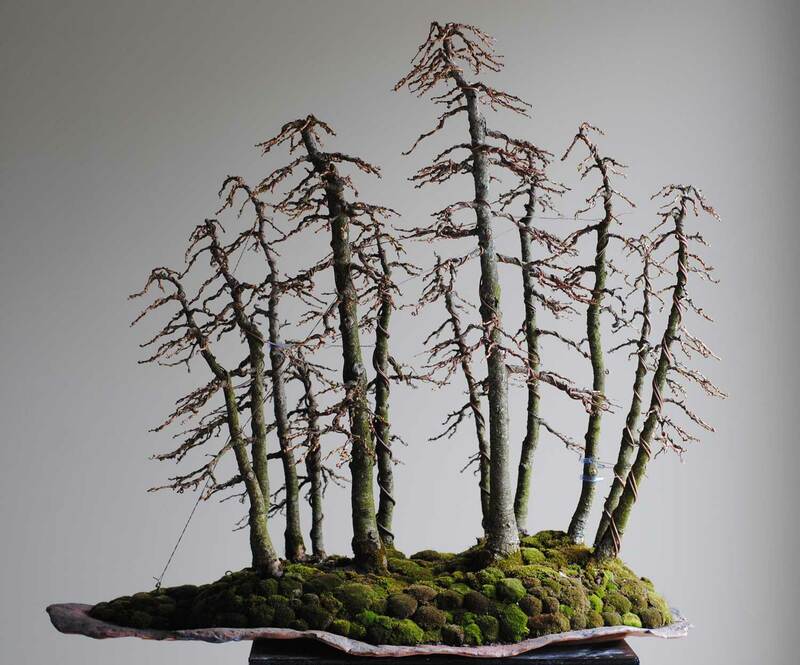 All of the secondary branching was cut off last year, so futame-futaba-nokoshi provides a good opportunity to carefully create the future secondary branches. The cutting/wiring was done almost exactly one month ago, and the follow up pictures are from today. This tree will probably have another round of cutting this year, as well as flower bud removal. 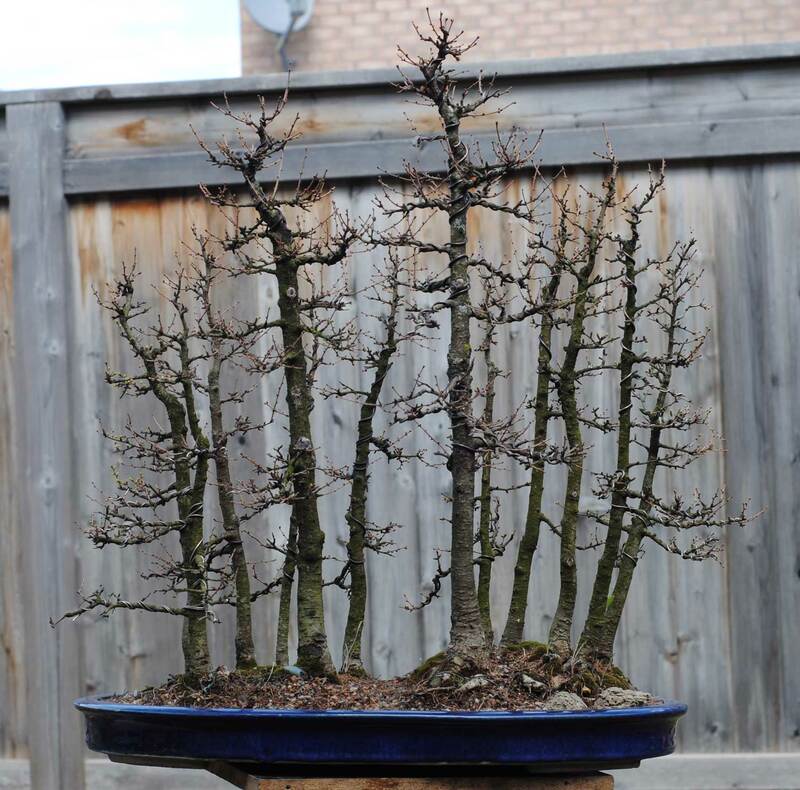 Some long and awkward branches still need to be removed/shortened. One view (front?) after cutting and trunk scrubbing. 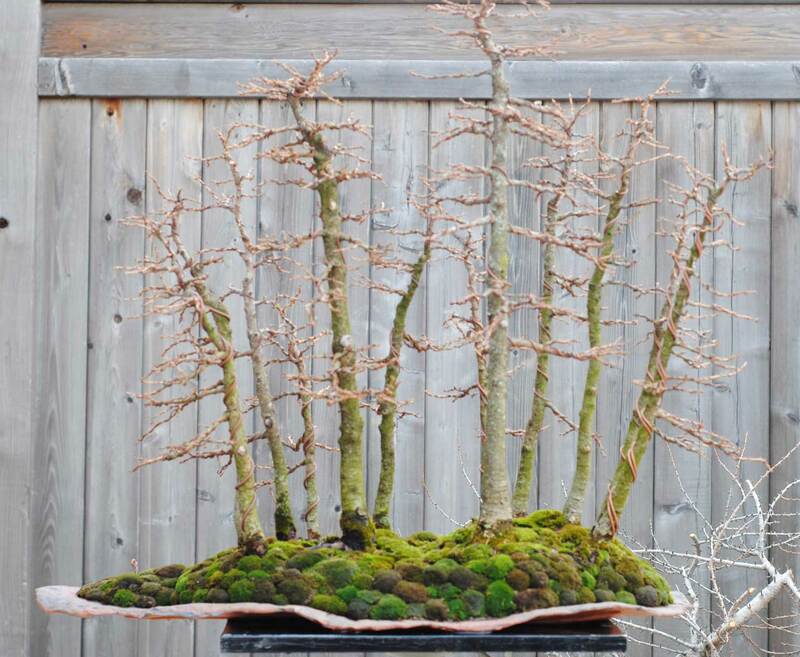 This Carpinus caroliniana forest was made in the Spring of 2013 and this year it was defoliated for the first time. 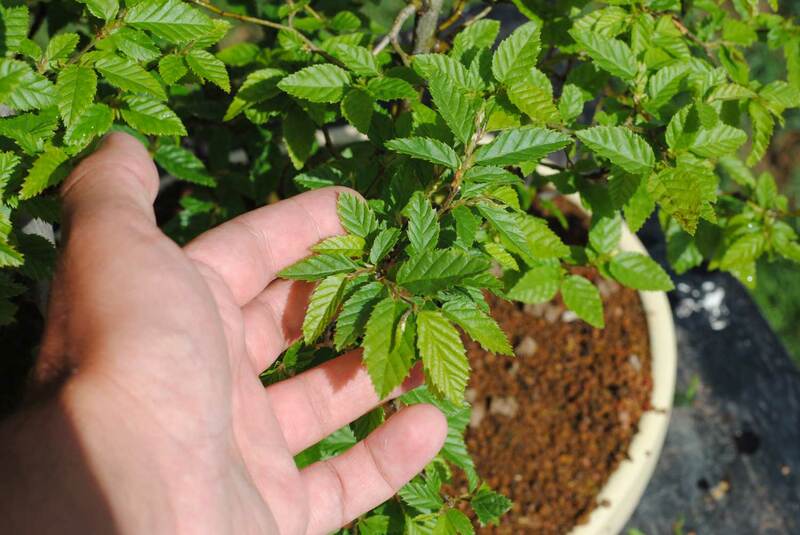 Owen Reich told me that American Hornbeam respond well to defoliation (maximum once per year) and indeed the results were positive. One issue I noticed is that as the second flush was coming in, some very vigorous leaves grew back at an accelerated pace and became very large. These were periodically removed to allow the smaller, less vigorous leaves to fill in at a more uniform pace. 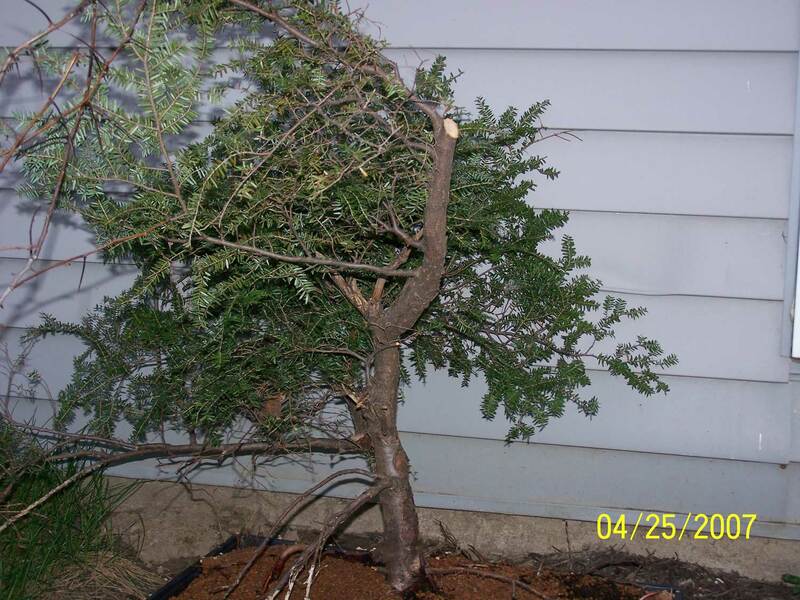 The tree was defoliated May 31st, just after the new growth had hardened off. One month later, the second flush had filled in and hardened off. 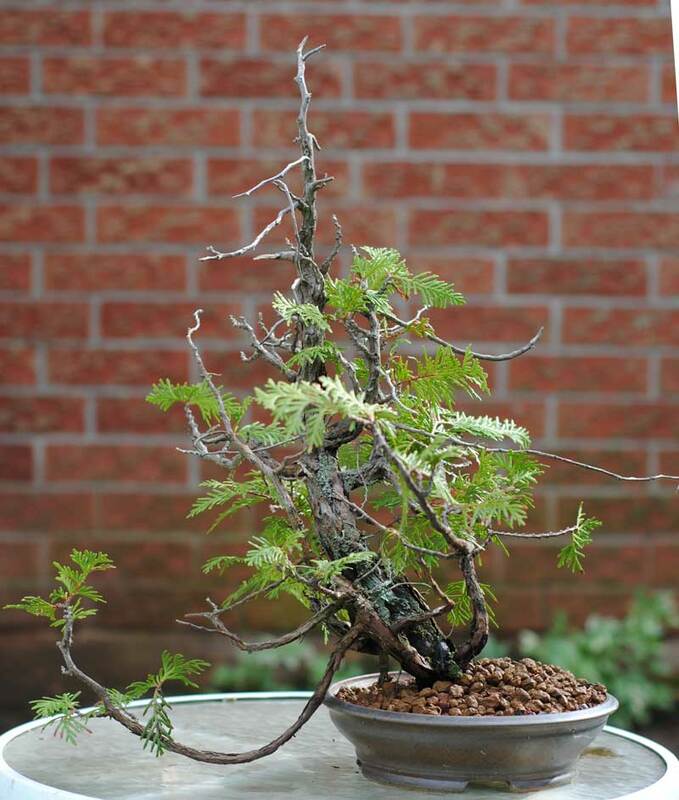 May 20th, ten days before defoliation (I forgot to take a picture right before defoliating the tree). The leaves here are not quite hardened off. May 31st immediately following defoliation. The tree today, just over one month after defoliation. 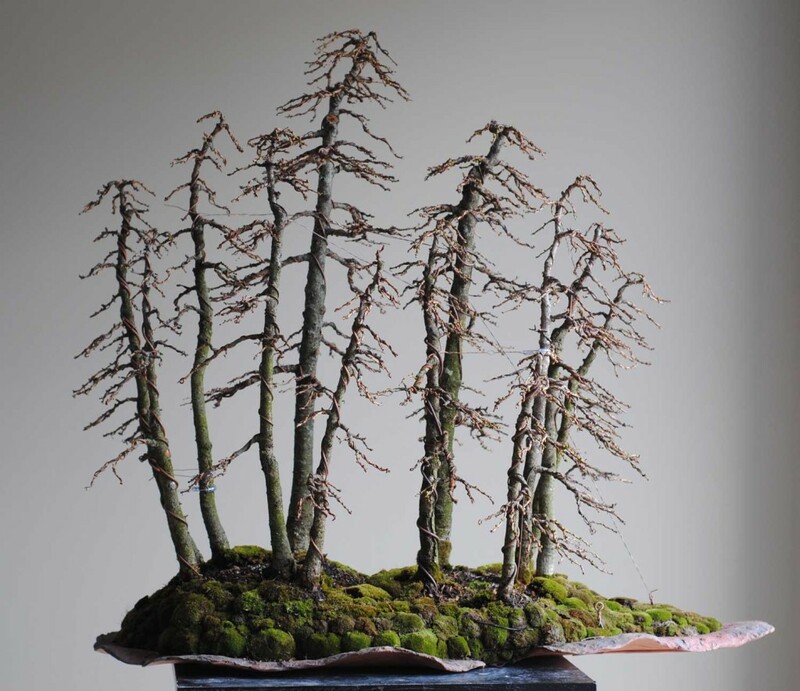 One major effect of defoliation was that the smaller interior shoots were allowed to open up. Many did not open up at all in the spring as all of the vigour went to the shoots of the exterior canopy. After defoliation, the density of the tree is much more uniform. The new leaves are about 50% the size of the old ones. Very nice! This is the first tree I ever collected, over eight years ago now. The development of this tree has been one step forward, two steps back. 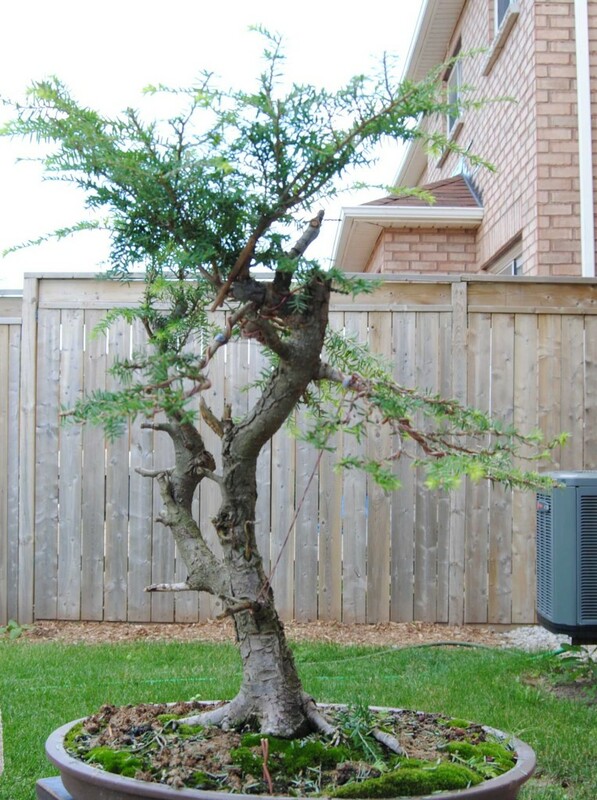 There is limited information out there on T. canadensis and I’ve only seen two that could be called bonsai (this tree isn’t one of them). This is probably for two reasons: 1) it is hard to find worthy material, and 2) they are a quirky species to work with. They very, very much prefer a rich and moist organic growing medium. I almost killed mine by transplanting it into a coarse, inorganic medium. Replacing it with topsoil restored the health of the tree. They can tolerate practically any light condition from full shade to full sun. 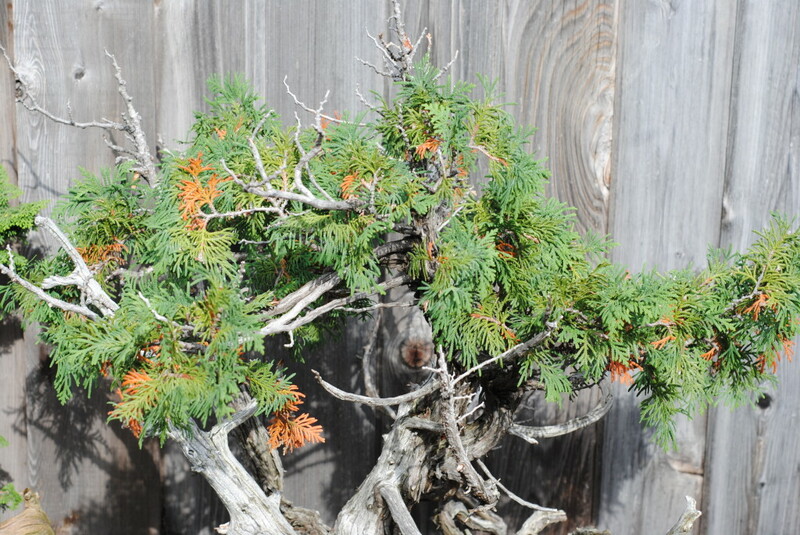 For bonsai development, several hours of direct morning sun is good for promoting backbudding and branch development. Full direct sun tends to cause the foliage to lose it’s rich green colour. 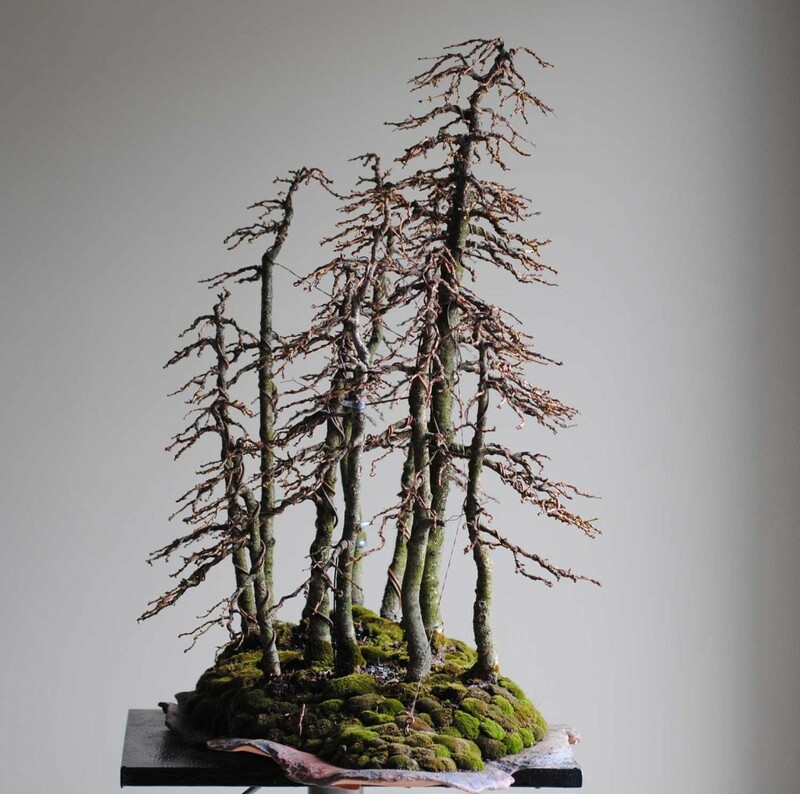 Despite their delicate and almost “weak” appearance, they heal over wounds better than any conifer I can think of and better than many deciduous trees. This makes grafting easy on T. canadensis. 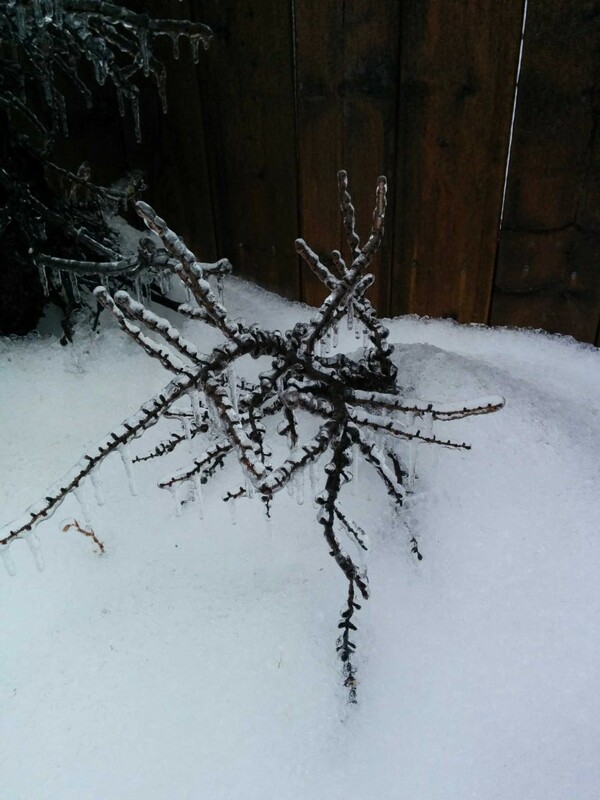 The branches are very flexible however they are extremely weak at the crotches. They will suddenly and heart-breakingly tear from the trunk with little notice during heavy (or even moderate) bending operations. 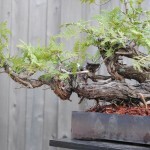 However, their capacity to rapidly callus over wounds means that a branch will more often than not survive, even if you have torn half of the base away from the trunk. I have learned and re-learned these points “the hard way” on this poor specimen over the years. The resulting setbacks have probably doubled the time it should have taken me to get to the current stage of development. Now this tree has immense sentimental value to me despite being one of the last trees that draws the attention of any visitors to my yard. 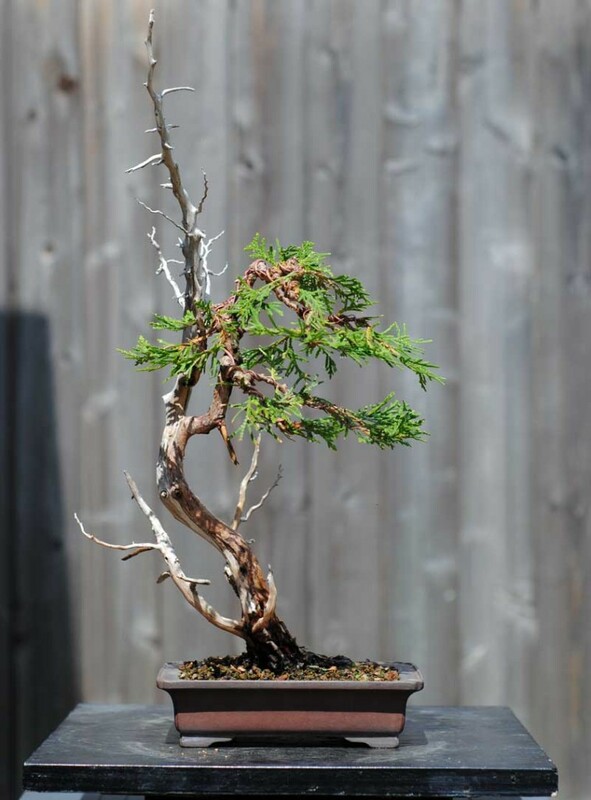 I believe Eastern Hemlock is by far the most delicate and feminine species native to eastern North America, and perhaps even all of North America. This makes it priceless in our catalogue of native species and worthy of greater attention. I just wish material was easier to come across! My T. canadensis today after finally getting the main structure set into place after eight long years. Still a long way to go but I think the hard work is done. Last summer I was trying to fully style the tree and had to stop at this point after I tore a major limb that supported two major branches – the first branch on the left, and the back branch. Growing near a trail in April 2007. Collected and potted up showing the current front. 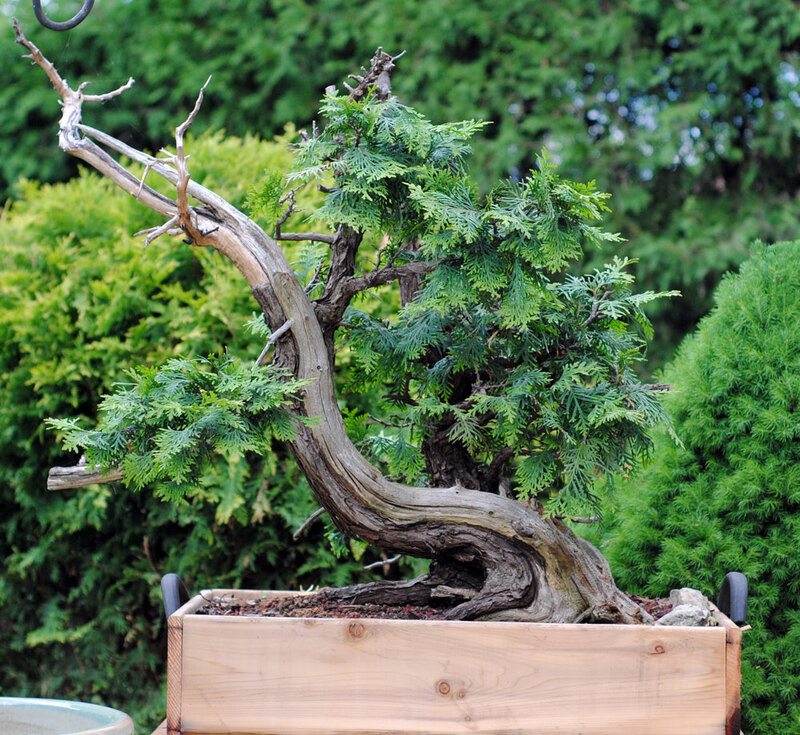 This old American larch (tamarack) bonsai, along with two others, was stolen from a private collection in Toronto on June 23rd, 2014. 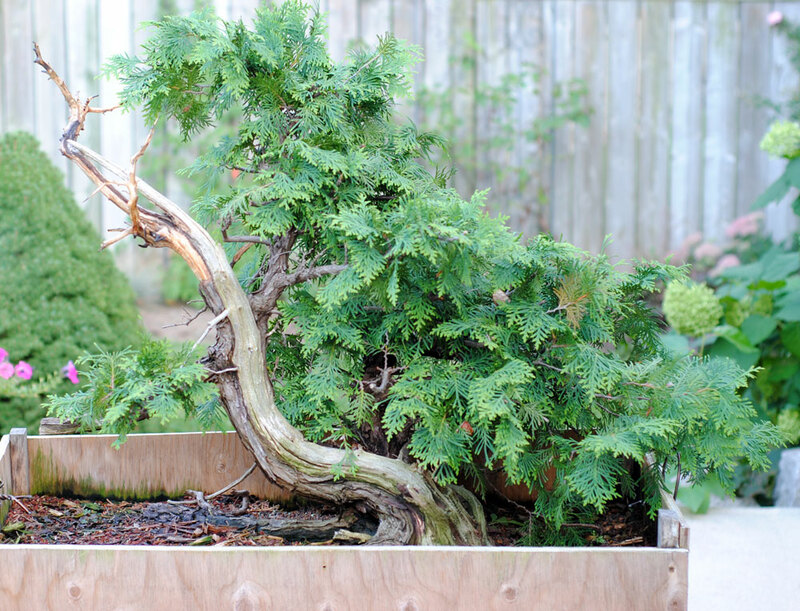 The bonsai community is tight not only in Toronto but worldwide. Hopefully we can use this to our advantage to help get this lovely tree back to the owner. 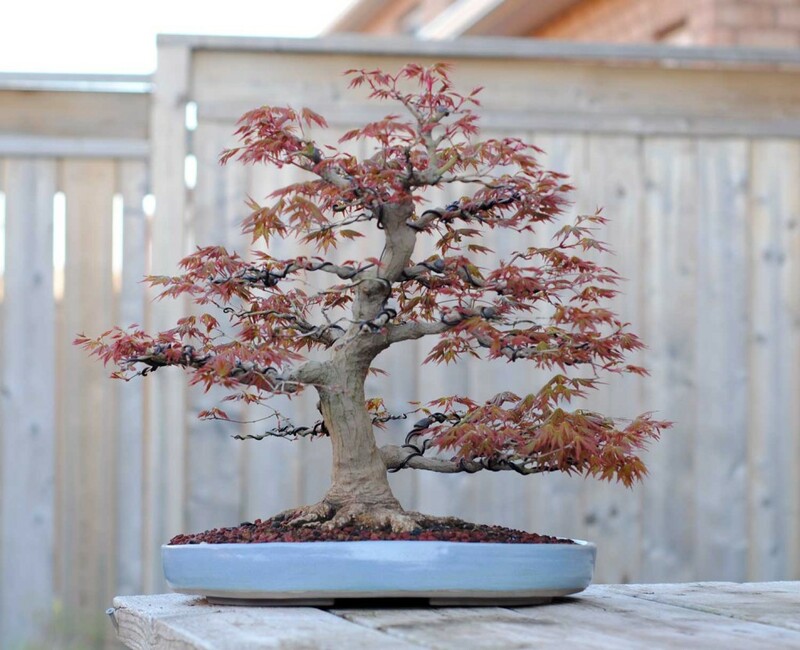 Click here or the image below to see a gallery of over 60 trees exhibited by the Bonsai Society at Royal Botanical Gardens to honour the 25th anniversary of the twinning of Itabashi, Japan with Burlington, Ontario. 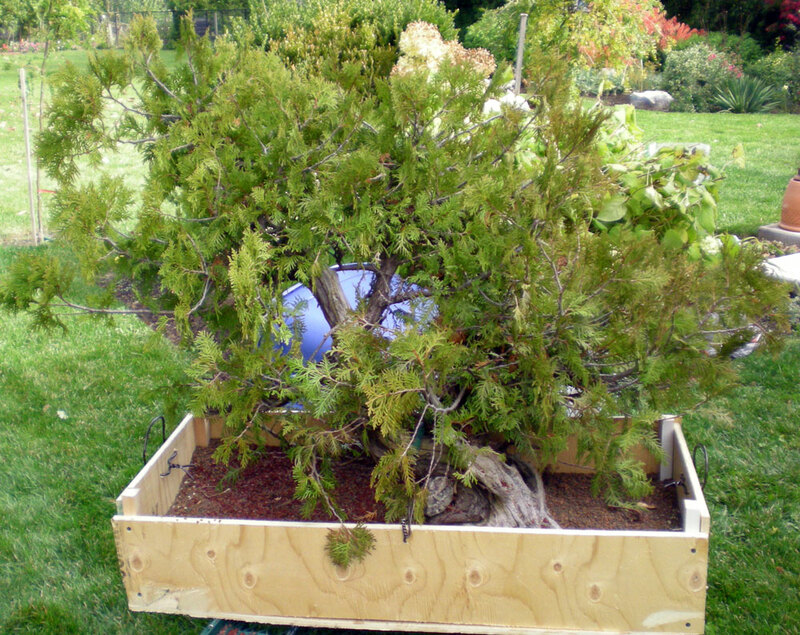 Blue rug juniper bonsai exhibited at Royal Botanical Gardens. Click here for the full gallery, or the image below. 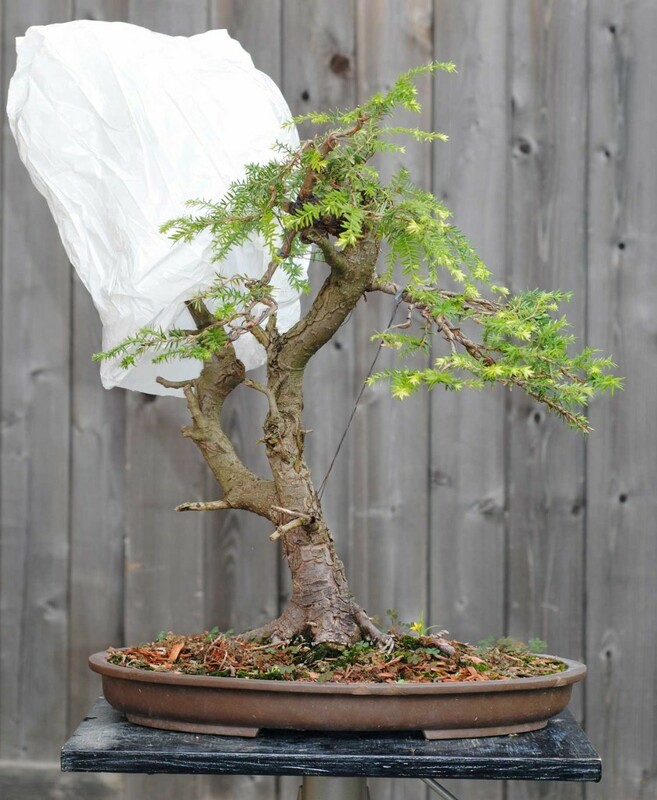 Collected Thuja occidentalis by TBS member Mike M.
According to Ryan Neil (see this video starting around 26 minutes, courtesy of the most excellent and prolific Bonsai Eejit), the overall feeling of a bonsai is determined by the combined directions of the trunk, main branch, and apex. 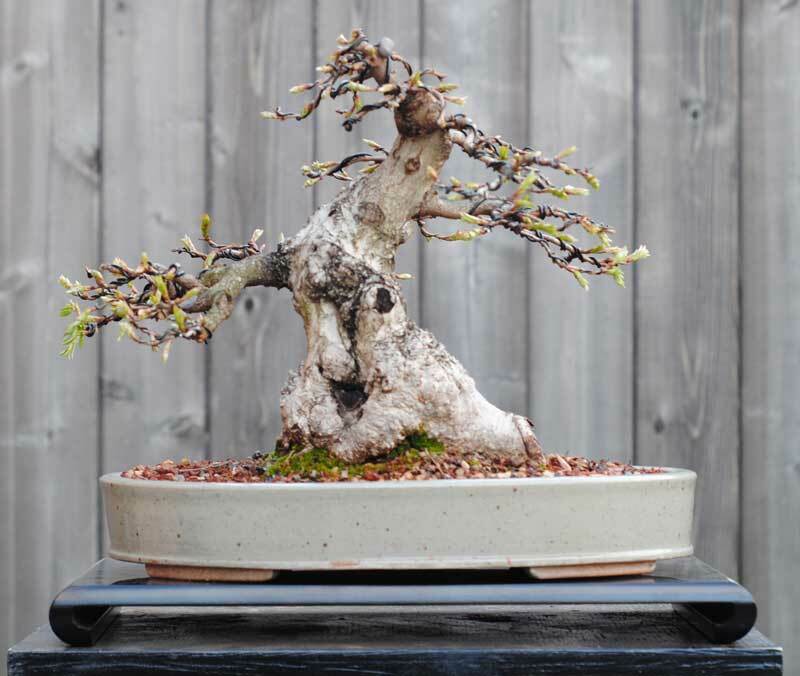 Trunk, main branch, and apex all move in the same direction. 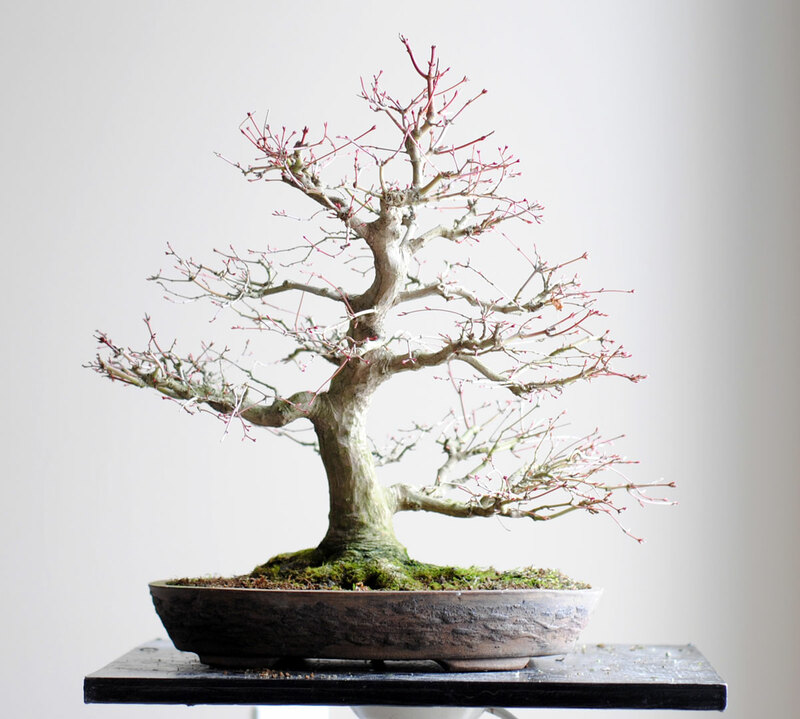 This creates a calm, feminine bonsai. Trunk goes one way, but the apex and main branch go in the opposite direction. This creates tension. Trunk and apex the same way, but the main branch goes in the opposite direction. 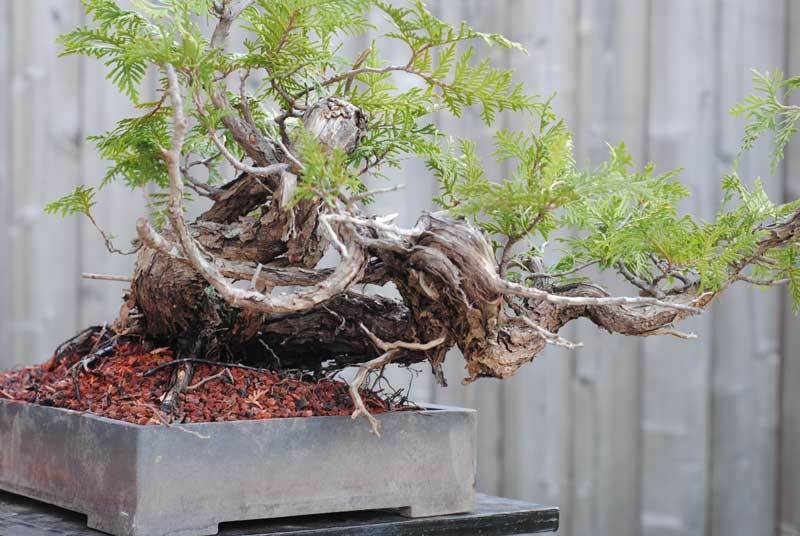 This creates dynamism and is rarely seen in Japanese bonsai. Of course there are other scenarios such as the trunk and main branch going the same way while the apex goes off in the opposite direction. 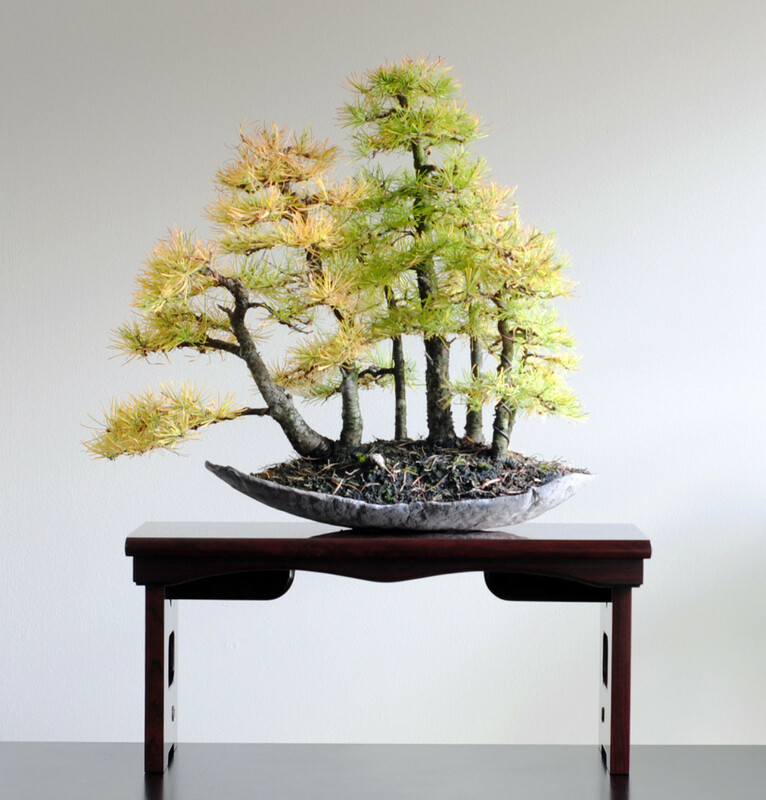 My guess would be that this creates imbalance thus it is difficult to design an attractive bonsai with this layout. Ryan’s comments really stuck with me when I first saw this video. 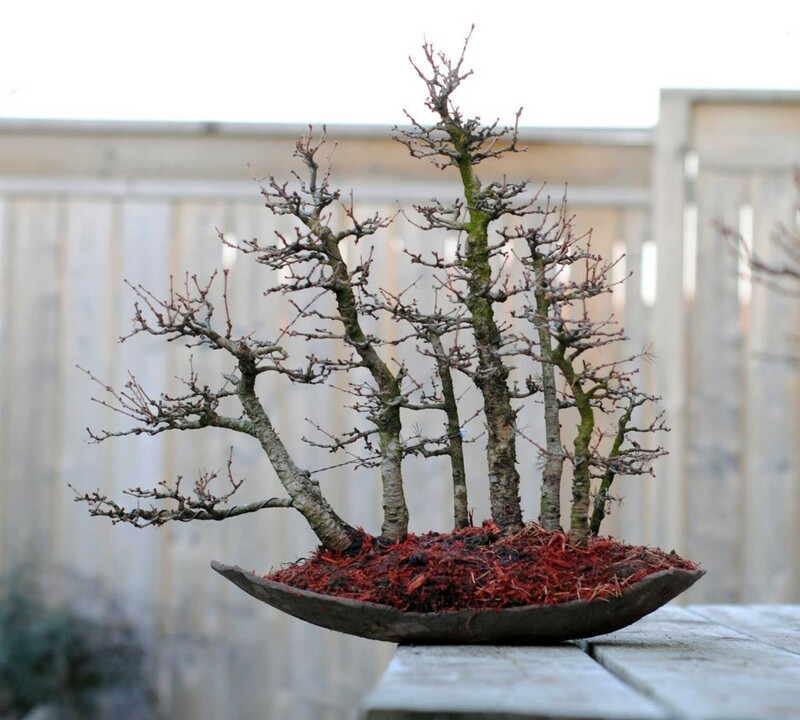 This is a simplified but useful approach to bonsai design. 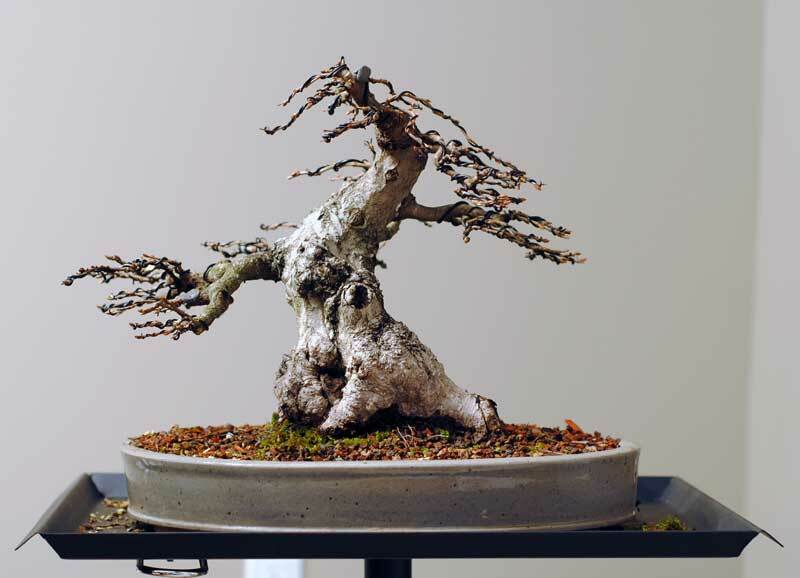 Of course, there are exceptions to the above scenarios just as there are exceptions to everything in bonsai. 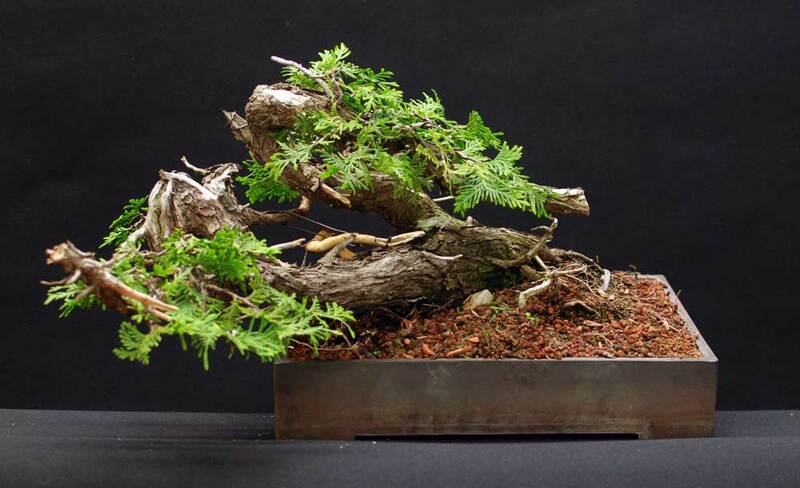 When I was doing the initial wiring on this Thuja this weekend, I was aiming to create scenario #2 – Tension. 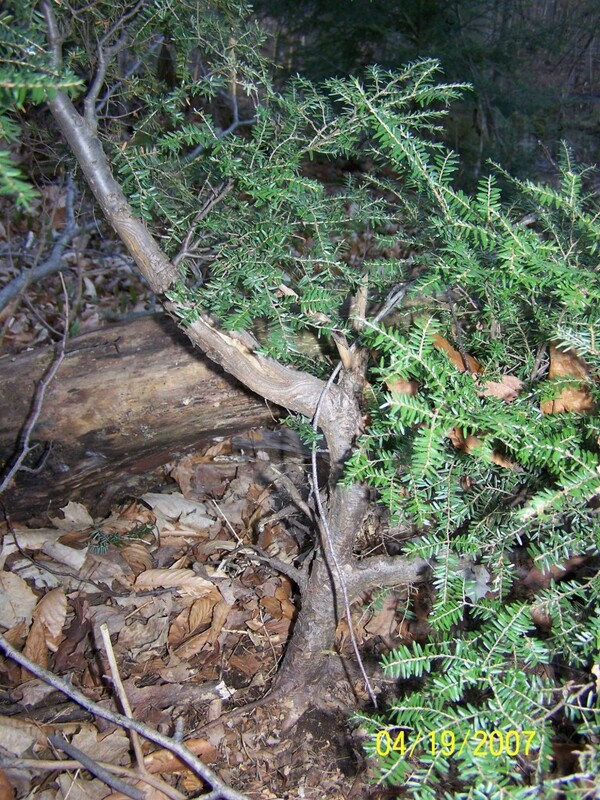 Two trunks which strongly move to the left and apices/branches which strongly move to the right. This made a fun and compact design. As a side note, my initial plan for this tree was to have everything moving to the left… trunks, branches, apices. It seemed like the most logical design. However, doing this would cover up the best feature of this tree – the two “kinks” in the trunks that boast some very nice deadwood. The current design makes it possible to emphasize those kinks and, importantly, makes a more compact tree. Trunk lines like this are what keep me trekking into the wild each year to scour for nature’s freaks. 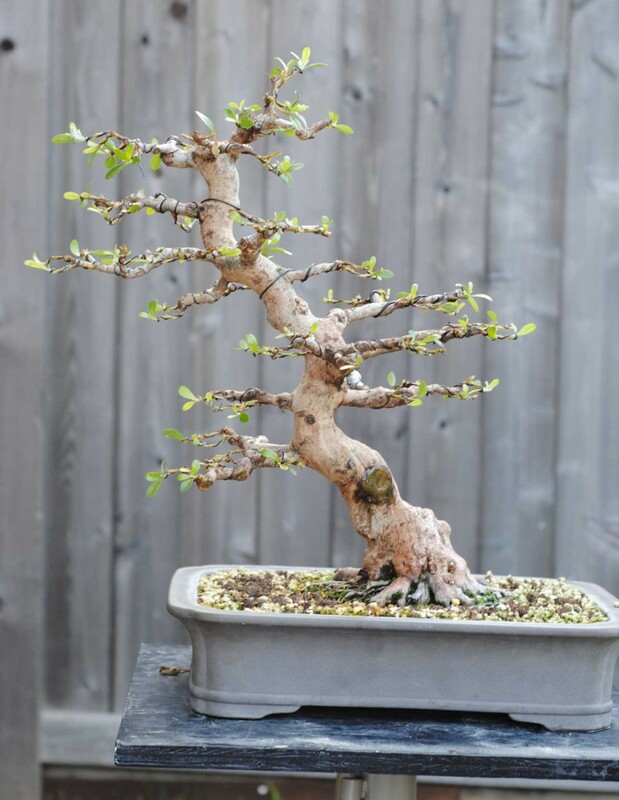 This tree was collected Spring 2013 and is gaining strength quickly. I am excited to do the initial work this summer. 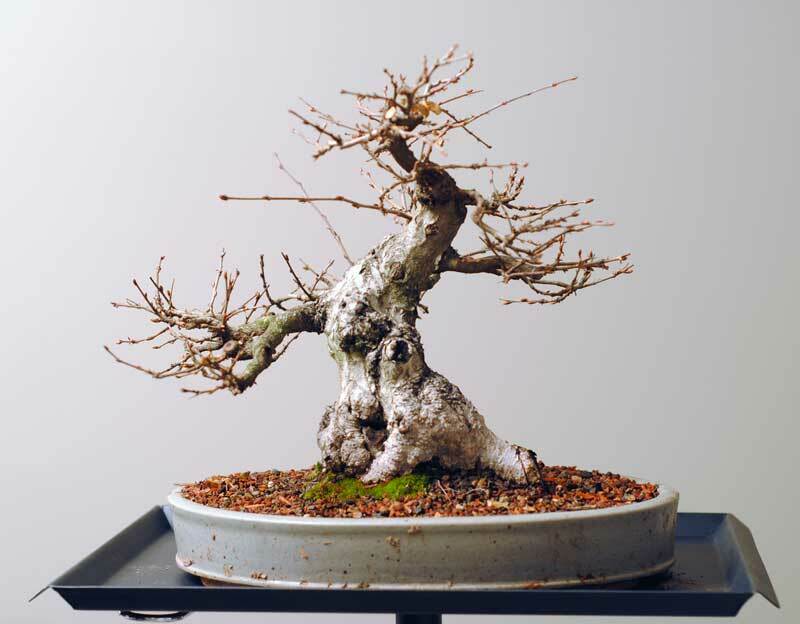 I have been working on this korean hornbeam since 2006. A major mistake I have been making over the last four or five years has been overfertilizing in the spring. This has limited the development of fine ramification and as a result the growth is still somewhat coarse. This spring it was thinned and wired. Owen Reich visited my garden last week and he made some adjustments to the positioning of the finer branches, adding more movement and natural lines to the branching. Late April before cutting and wiring. After cutting and wiring, before Owen Reich. After Owen Reich’s adjustments. The details are a bit difficult to see as the tree is leafing out. An early picture, as purchased. I bought this tree in December 2012. 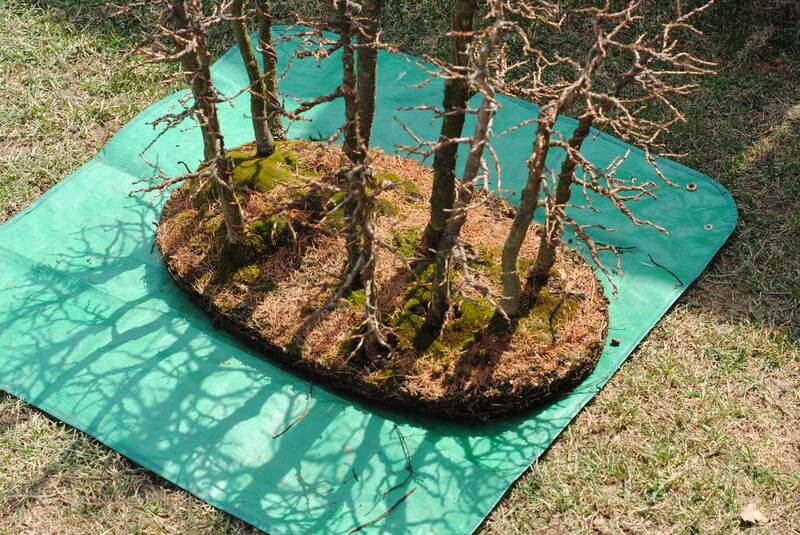 Being an established forest, it had some nice character but also some major challenges. Besides the unsuitable pot, the forest had far too much symmetry and the branches were too “stubby”, for lack of a better word. 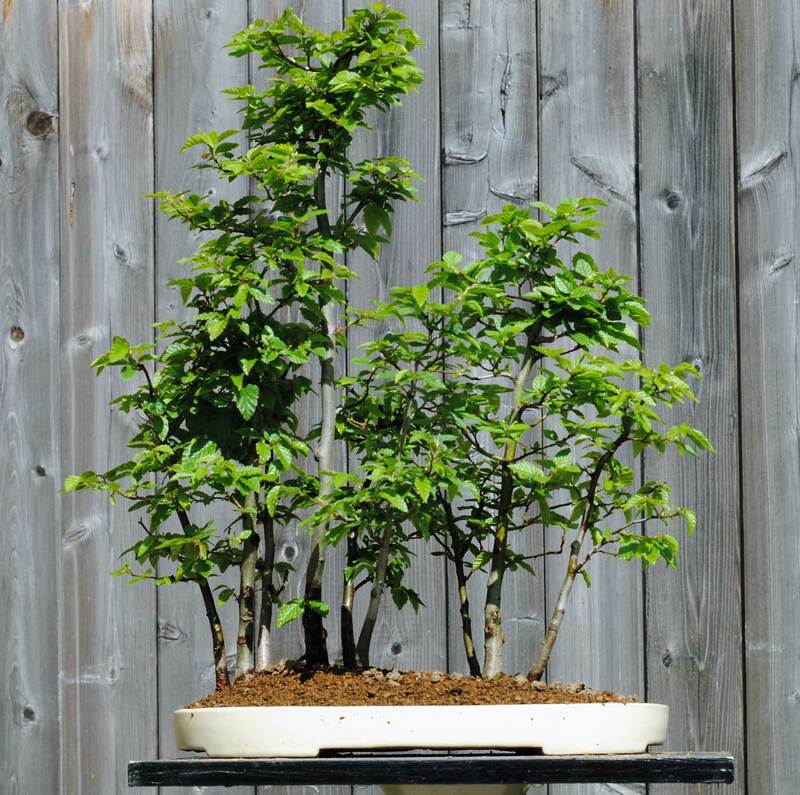 The variation in the trunks (diameter and height) is limited, Some of these things would be easy to correct, but others more difficult or impossible. 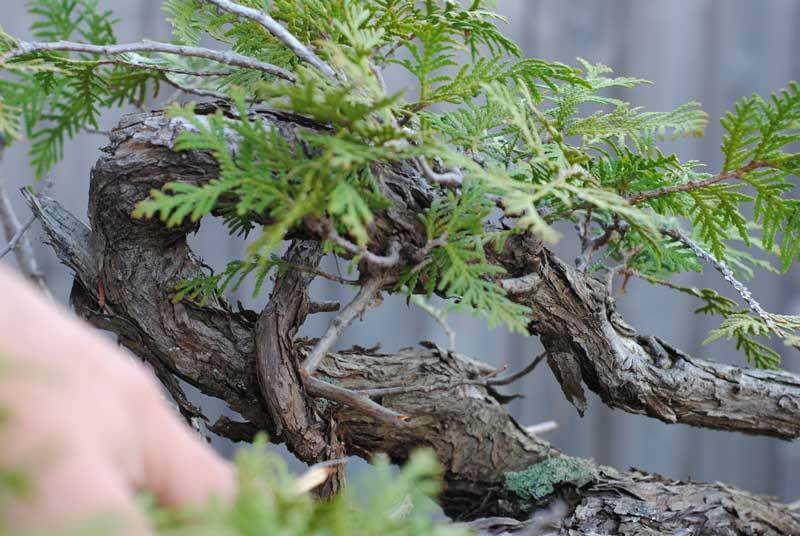 The year 2013 was spent just growing it out and lightly pruning to develop a more elegant branch structure. As a side note, this tree spend the entire winter out on a bench completely unprotected. This was the coldest winter in southern Ontario in over 20 years with many days in the -20 Celsius range and a few in the -30s. 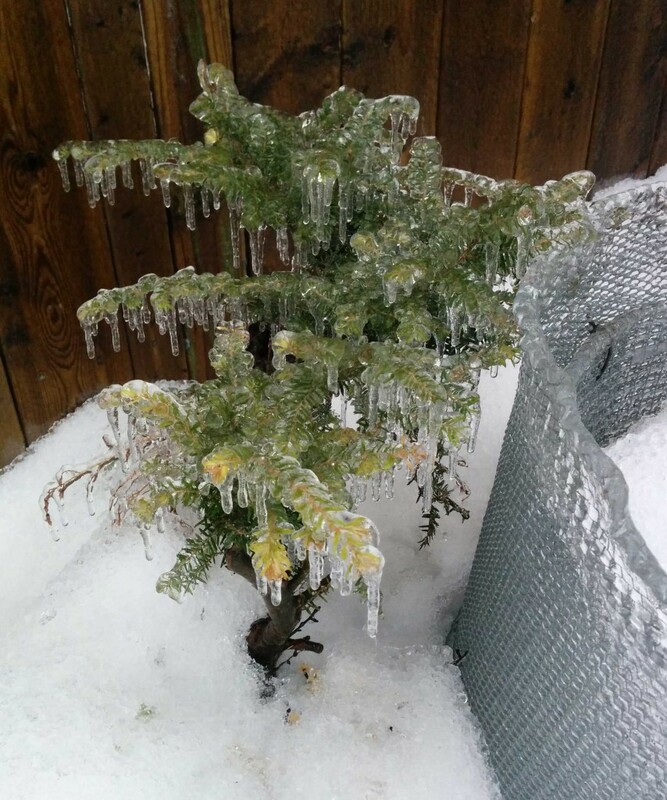 Fortunately there was a lot of snow and this larch was right at home. 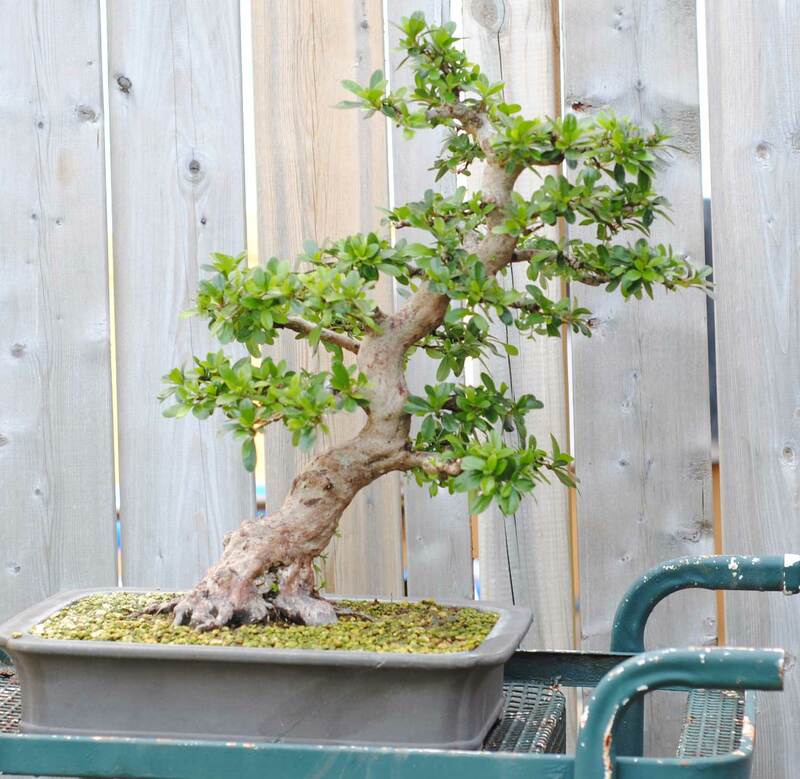 The tree in Spring 2013, as purchased. Some trunks are not fully visible from the original front. The first step for this year was to wire everything. This probably took 12 hours, spread out over several days. Conifer forests just take so much wiring, it can be overwhelming. After wiring. 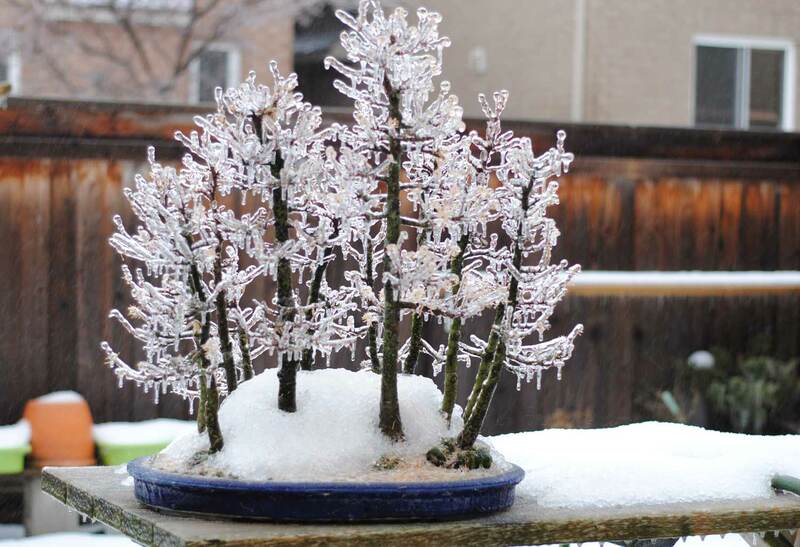 No branches have been placed yet. Note the number of new branches compared to the Spring 2013 image. The next step was to plant it in a more suitable container. 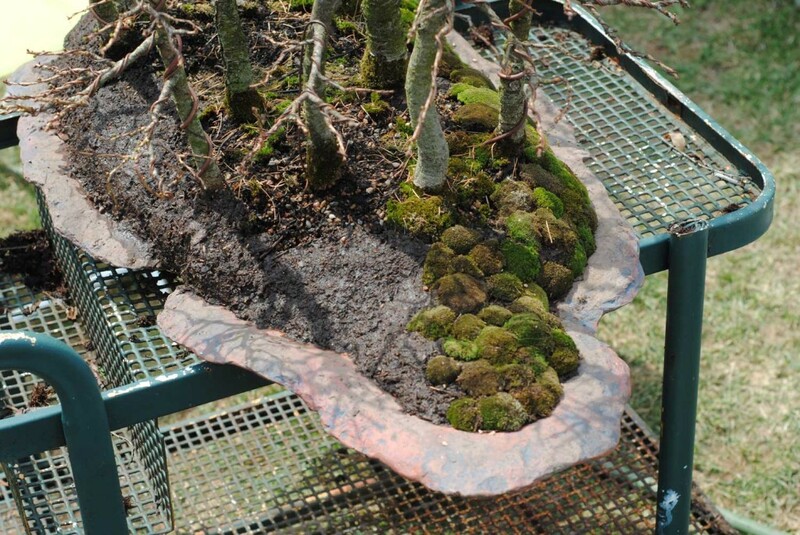 This slab was custom made for the forest by local potter Geoff Lloyd. One thing we neglected to think about was the front of the slab. The slab was designed for a forest pointing to the right, yet this forest obviously points to the left. As a result I ended up using the “back” of the slab as the front. It is still an attractive side, but has a slightly less interesting profile than the other side. 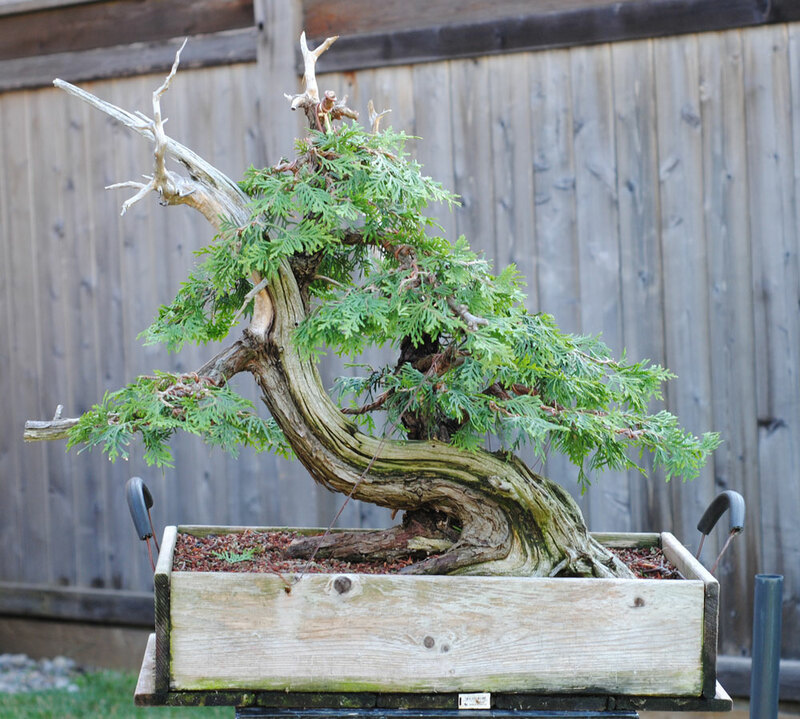 Intended front of the slab, best suited for a tree moving strongly to the right. Back of the slab, which will actually be my front since my forest moves to the left. 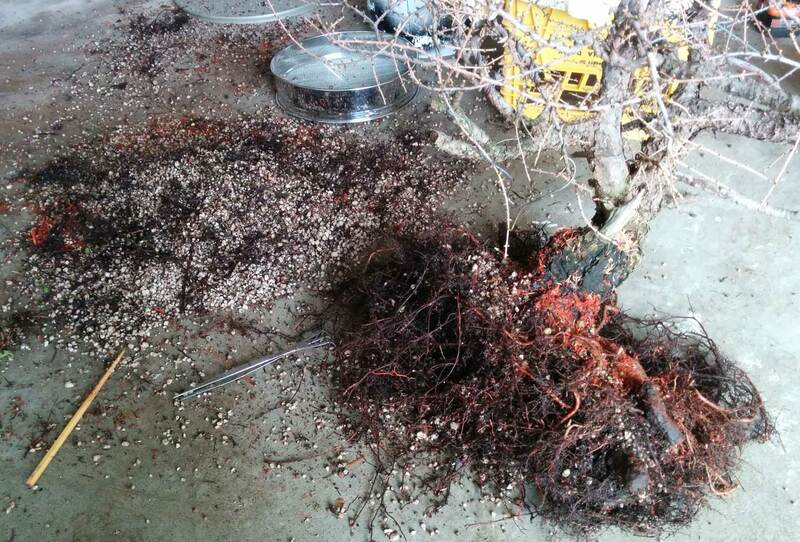 The next step was removing the tree from the old pot and raking out the perimeter of the root ball. The bottom of the rootball was not touched at all. The perimeter needed to be raked out quite a bit so it would fit within the boundaries of the narrower new slab. 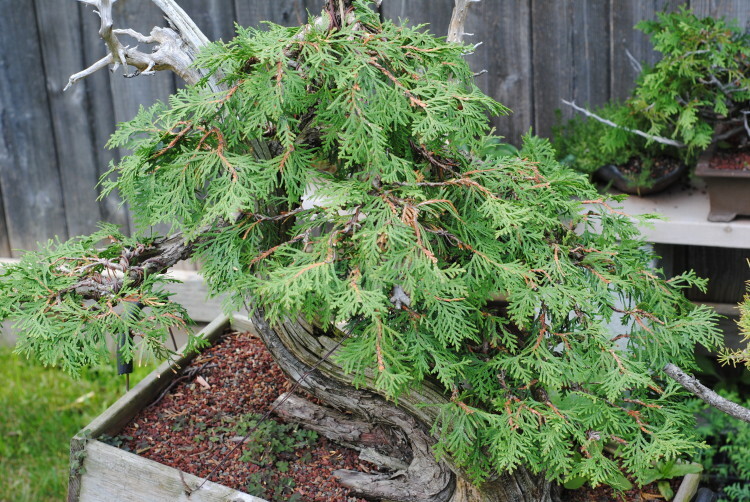 Removed from the old pot, before raking. Sorry, no post-raking pics. A muck mixture was made to mold the rootball within the contours of the new slab. The mixture was something like 2/3rds humus, 1/3rd chopped sphagnum, and a cup or two of akadama dust, plus water as needed. After mucking the perimeter, the rootball was completely mossed. The purpose of this was mainly to prevent erosion of the freshly worked rootball, but of course there is an aesthetic benefit as well. Besides the muck, no new bonsai soil was added. The roots still have plenty of room to grow in the original root mass. 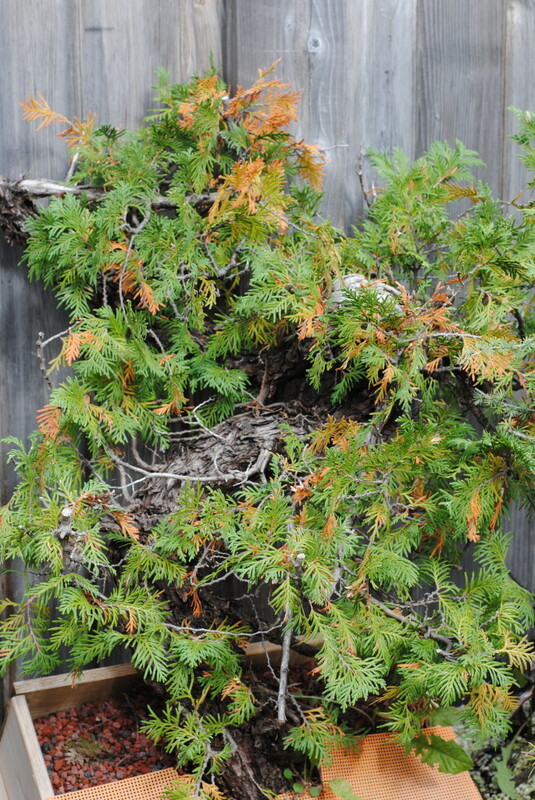 Larches are perfectly happy with dense matted root balls with scant amounts of soil. It will be a long time before I need to refresh the soil again. This picture shows the mucked perimeter (left) and the slowly progressing moss job. After repotting. Still no branch placement. 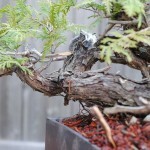 Now that the tree was in its new container, the branches could be placed. Many guy wires were used to reposition the trunks. Again, the goal was to give this tree a definite leftward movement. 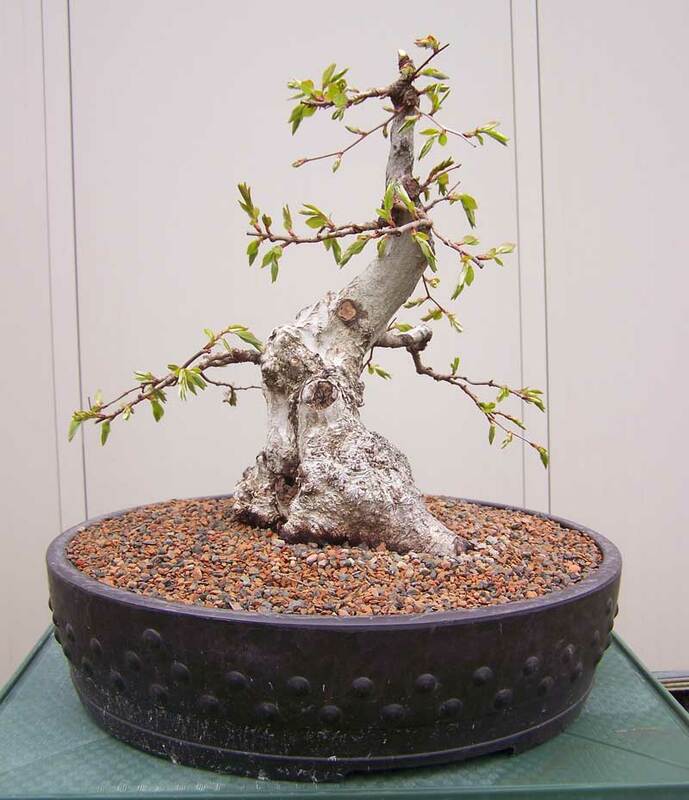 This was accomplished by pulling most of the trunks to the left and extending out the leftward growing branches while compacting those growing to the right side. I find forests to be immensely challenging as there are so many design considerations. 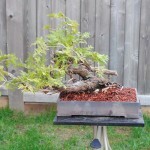 The branches and trunks were adjusted again, and again over several sessions. I am still not 100% happy with the design but I think it is the best I could do without removing or adding trunks. That is still a future option, but for now the work is done. Final image of the front. The farthest trunk on the right really bothers me. At one point I was very close to ripping it out. But I will take some more time to think about that. The tallest tree is 74 cm and the slab is 80 cm long. Thanks for reading. Don’t acquire too many forests if you value your sanity! Quite a flamboyant choice. Perhaps too flamboyant? Well, it technically is a flowering tree… although it certainly doesn’t carry that presence. Regardless, I find it a fun change. Old Yamaaki pot. This pot couldn’t handle the winter and developed some hairline cracks. Perlite is good (but that doesn’t make it pretty). I’ll keep this brief because soil discussions are not exactly exciting. This is the first tree I’ve repotted since I started putting all my collected trees in 100% perlite two years ago. The root growth has been excellent and I was glad to see that there has been no noticeable decomposition of the perlite after two winters. 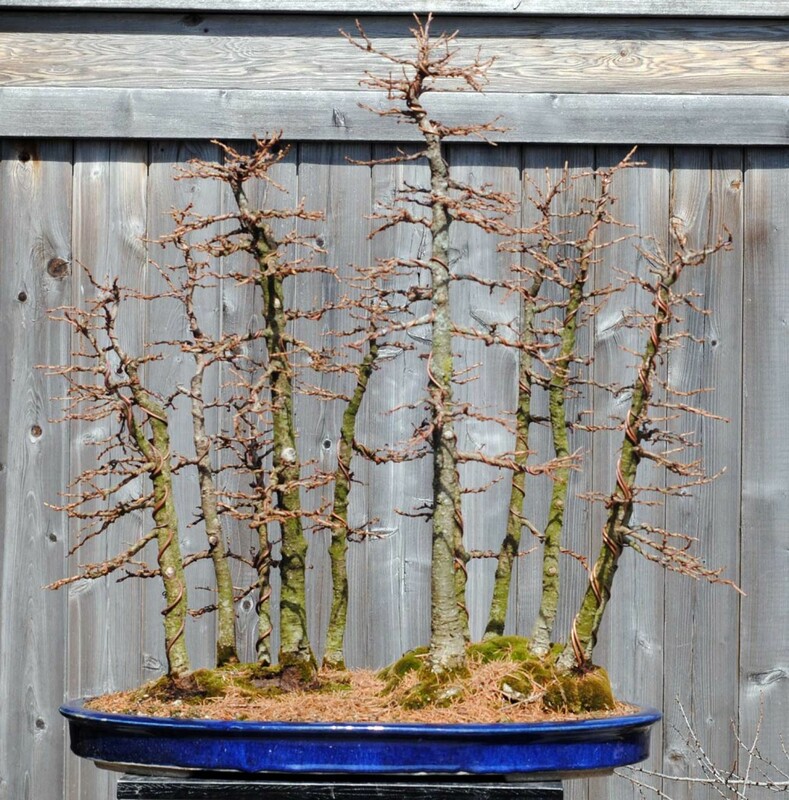 There are probably a million other substrates that larches grow equally well in, but you would be hard pressed to find one that is as inexpensive and lightweight as perlite. So perlite is good. Not exactly revolutionary. 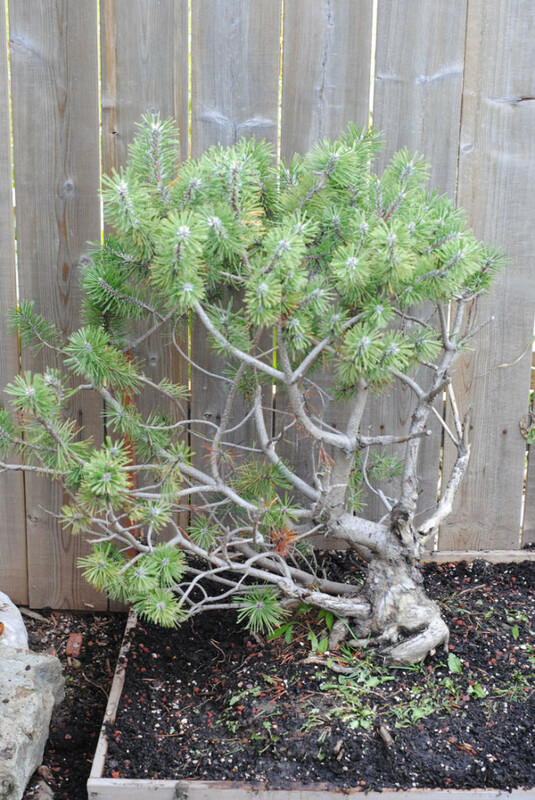 Collected with a weak root system in 2012. Now it has a strong root system. The red stuff you are seeing all over my trees is coloured mulch. I got it for really cheap last autumn but now the damned stuff is everywhere! This is a busy time of year. Once the ground thaws the larches start to move almost immediately. Then, you only have a few of weeks to get all the wiring done. 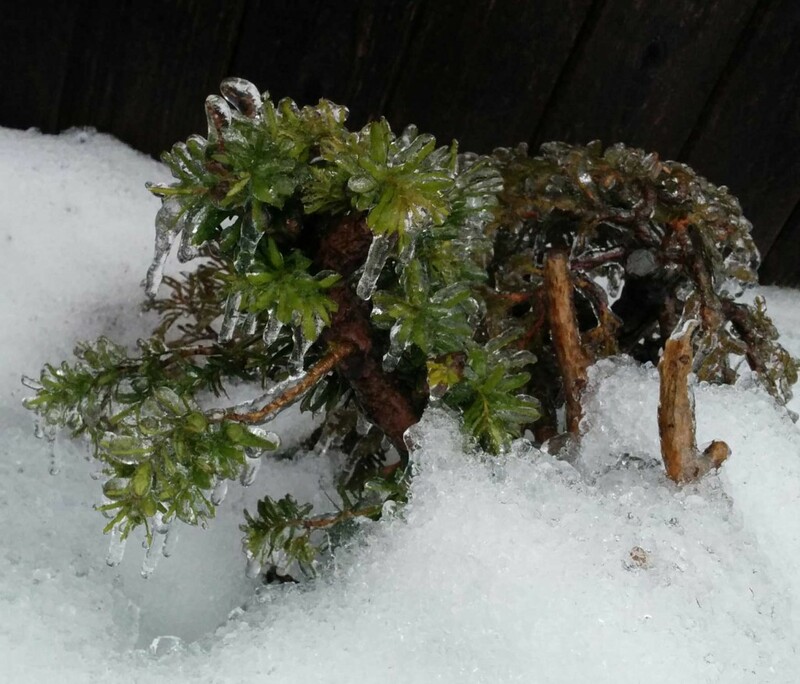 This is a main disadvantage of wintering larches in the ground. This small forest and a much larger one have taken up a lot of my free time over the last week or so. 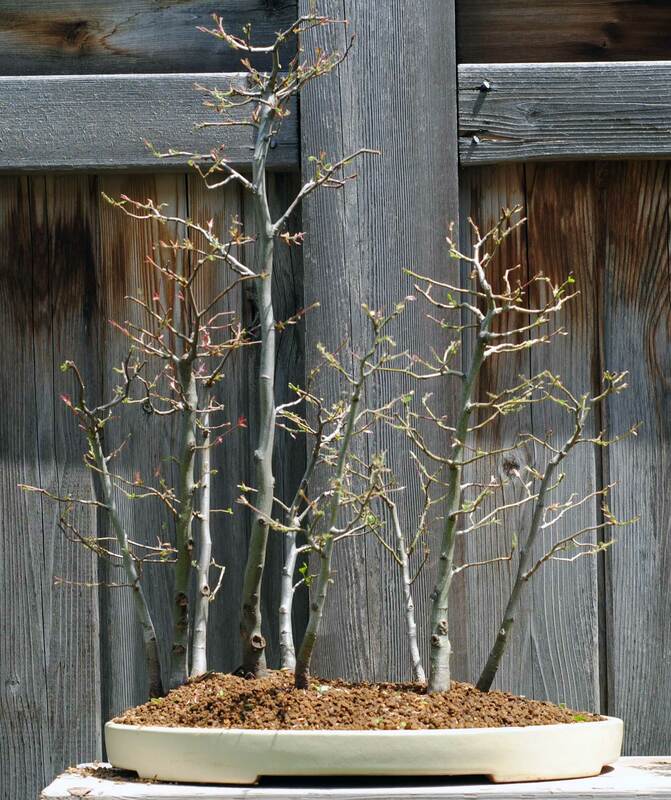 This spring I acquired my first Japanese Maple. 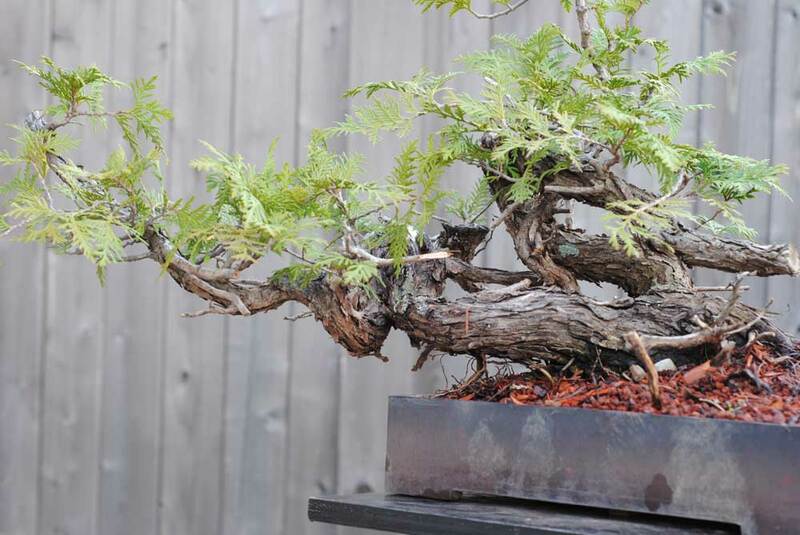 After ten years of bonsai, what took so long? Well I suppose it was a combination of finally having safe overwintering conditions and, more importantly, finding a good one that I couldn’t refuse. It originally came in a lovely textured unglazed John Pitt oval. 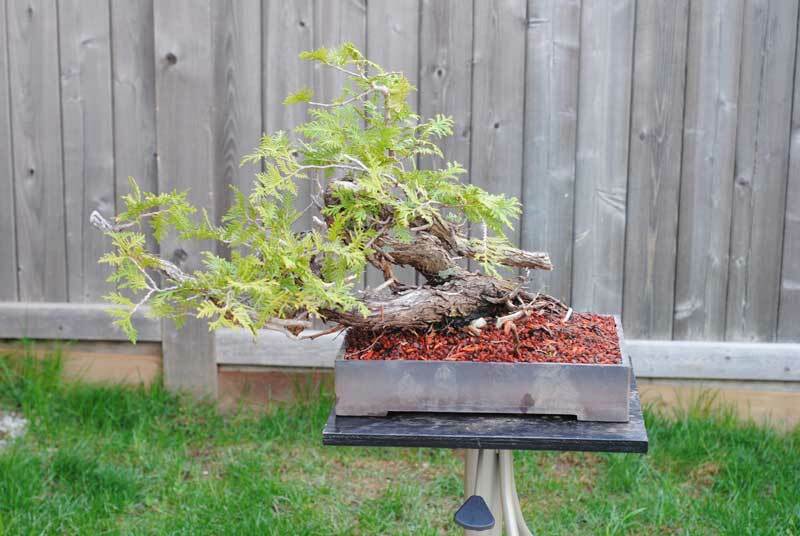 Great for a larch, but maybe not for this maple. I wanted something a little more flamboyant, so I planted it in a pale blue glazed custom made pot by local potter Geoff Lloyd. Geoff has only been making pots for a couple of years but he is making serious progress. I own several of his pots and he even made me a large custom slab which I will be planting a larch forest on in a couple of weeks. If you need a bespoke pot and want to support your local artisan, shoot me an email and I will put you in contact with Geoff. A washed out picture of the tree as purchased March 15th in it’s original John Pitt container. Besides the repot, only minor work was done. 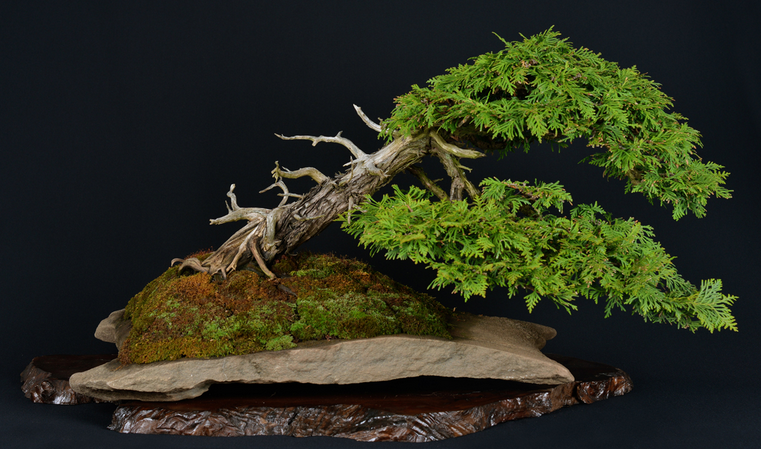 Some branches were wired, pruned, and the moss was brushed from the nebari after killing it with vinegar. Today in it’s new pot by Geoff Lloyd. Fellow Ontarians are probably wondering “how the hell is that thing already almost in full leaf?” Everything else around here won’t start moving for at least another two or three weeks. 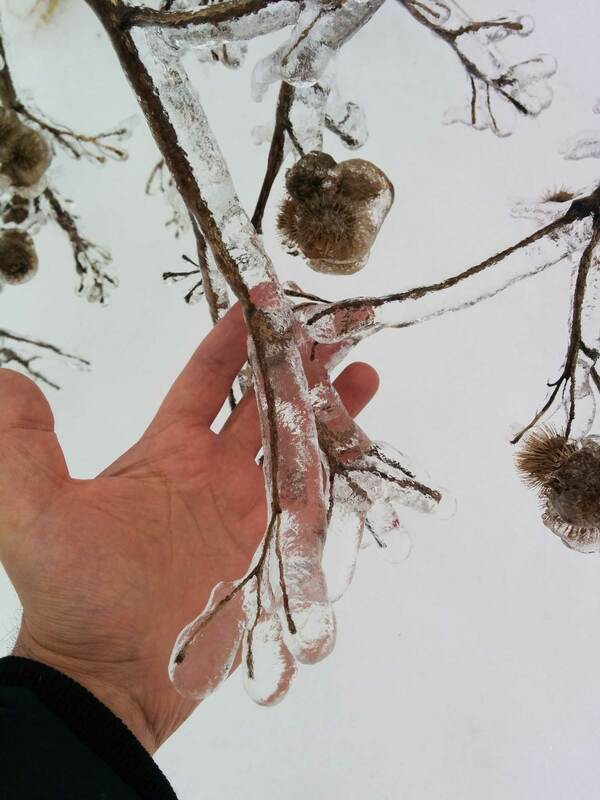 Well, you may have guessed that this tree came from southern Pennsylvania. I’ve been buying a lot of pots from Japan over the winter so I suppose it is inevitable that one would arrive broken (although it could have been prevented with better packing). Fortunately I didn’t pay a lot for it, but it is (was) still a valuable pot. Instead of tossing it, I took it as an opportunity to experiment with repairing ceramics. My goal is to make it usable which, in my climate, means it will need to stand up to constant moisture and freeze-thaw cycles. I love this style of pot and actually have the identical one in a smaller size, but it doesn’t have nearly as nice patina as this broken one. You might be interested in the excellent articles and videos that Lakeside Pottery has on repairing ceramics. Some really great tips in there. 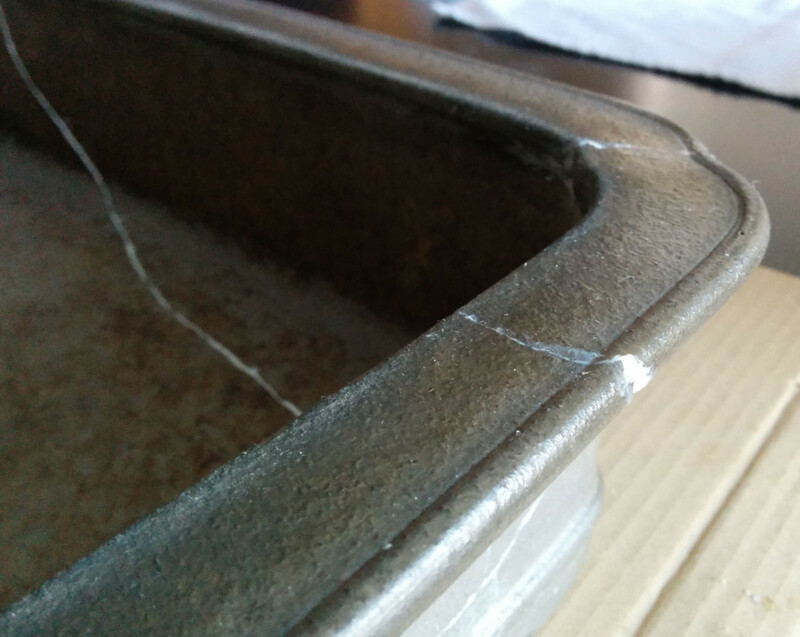 After asking around and doing some research, the general consensus seems to be that epoxy is the best adhesive for repairing broken ceramics. I purchased some water-resistant marine epoxy for the job. 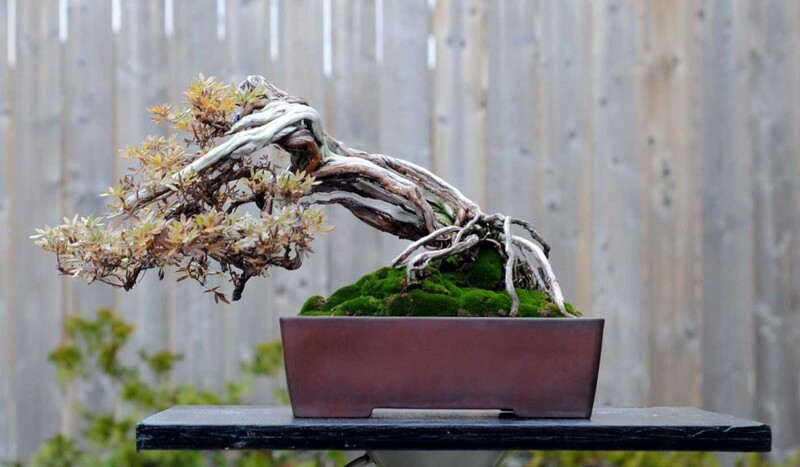 An experienced potter and bonsai artist warned that epoxy will degrade after constant exposure to moisture, but more on how I tried to address that issue later. Water resistant two part epoxy. After cleaning the broken pieces and doing a test fit (the order of assembly is important) I glued the pot back together in two stages. Excess epoxy that seeped out of the joints was wiped away with rubbing alcohol. The assembly was done in two stages, with the largest piece being glued on first, then the two smaller pieces the next day. The missing chips had been ground to dust during transit, so those areas were filled in with epoxy. The goal was of course to get perfectly flush joints, but I found that the quality of the joints decreased as more pieces were added. This is because as more pieces went in, the space taken up by the epoxy became incresaingly significant. This problem was magnified by the fact that there were so many joints. Removing some ceramic material from the joining surfaces might be a solution but could affect the final fit. One of the better joints. I blended brown and grey acrylic paints to try and match the pot colour. I knew it wouldn’t be perfect since the patina on the old pot results in a gradient of colours. But it was an improvement on the glaring white epoxy. Many of you have probably heard of the approach of highlighting ceramic repairs with gold (kintsugi). I love this look but think it is most suitable for chips, single-line breaks, and older more valuable pots. 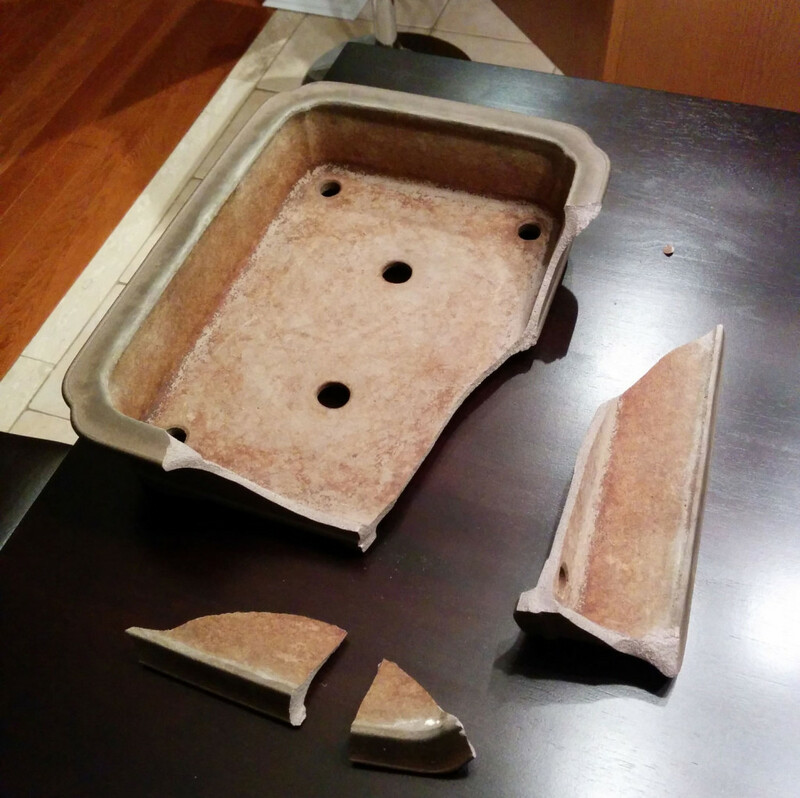 The break on this pot is more of a “why didn’t you just throw it away?” kind of break. Most damaged side of the pot, after touch up painting. 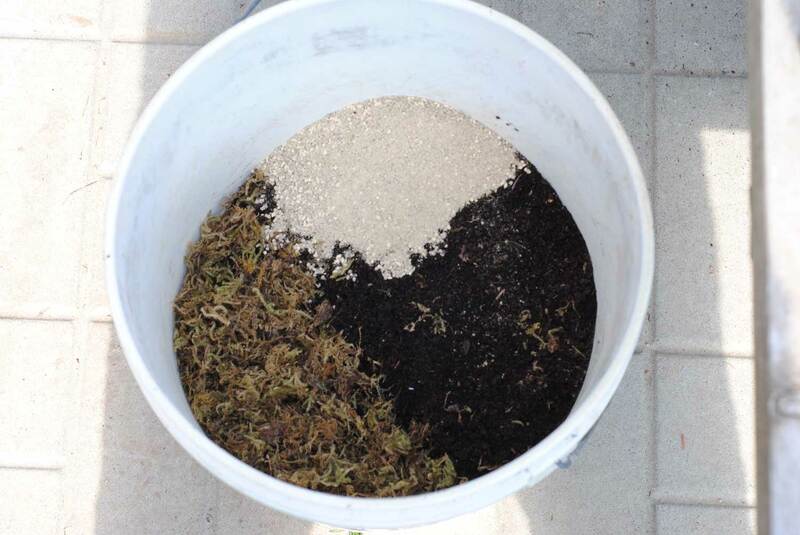 To try and prolong the life of this repaired pot, the final step was to apply a heavy bead of waterproof marine grade silicone over the inside joints. The idea is that if I can waterproof the epoxy line that sees the most moisture, I may be able to keep it together longer (since I was warned that expoxy . Yes it looks ugly, but my goal is to make this pot usable and the inside of course will not be seen when the pot is in use. Fortunately the pot still has an undamaged front which is presentable. Time will tell how well this repair will stand up to the elements. If you live in a cold weather climate and have tried a repair like this, I would really like to hear your experience. 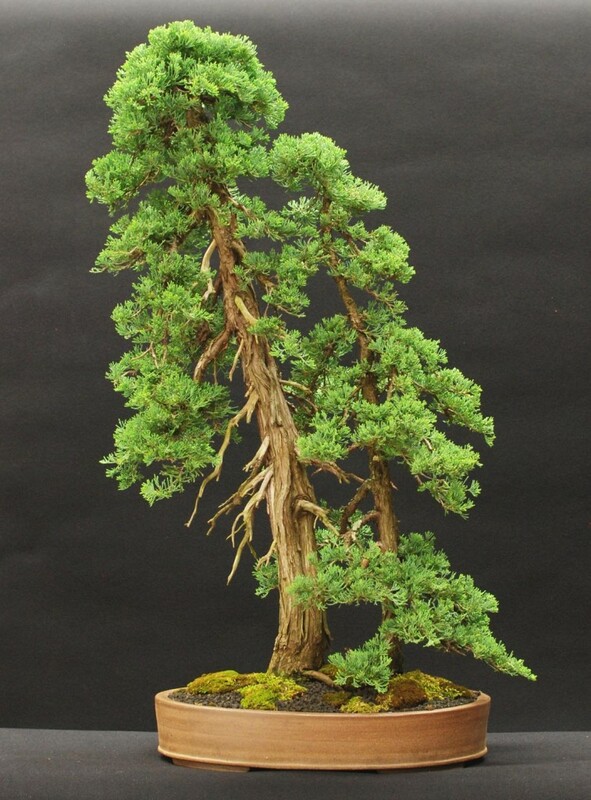 A limited quantity of Japanese Black Pine (Pinus thunbergii) seedlings are now available for online purchase in my For Sale section. 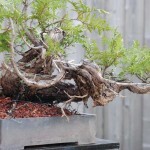 They are available in bare root bundles of ten seedlings. Canadians only, and shipping is free!